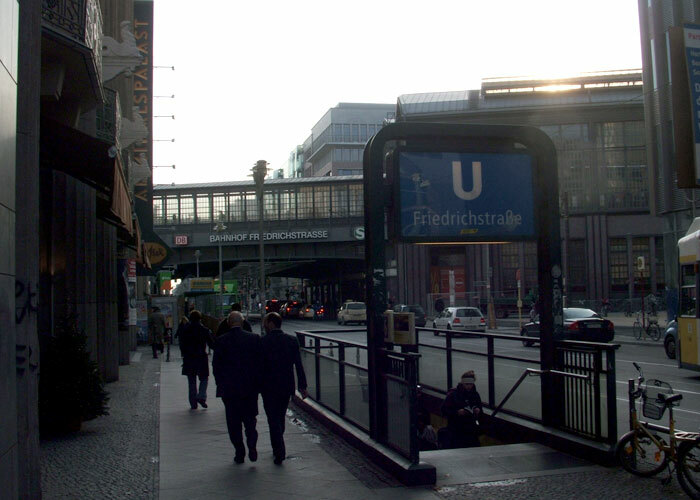 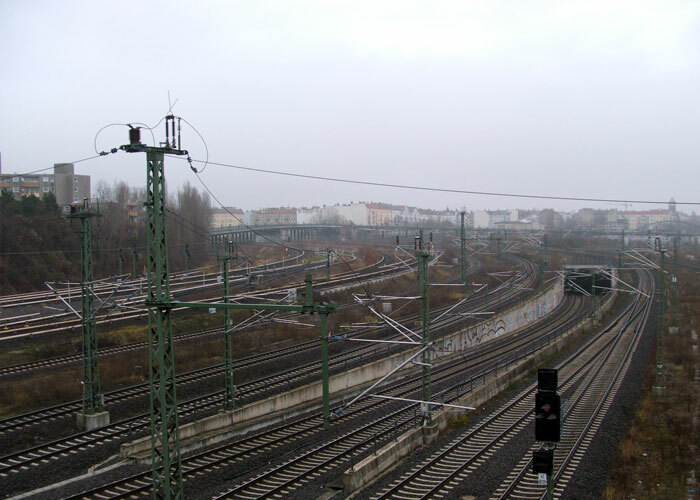 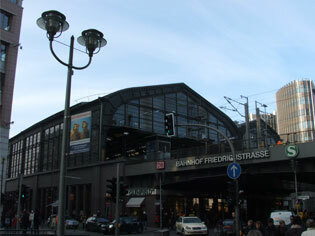 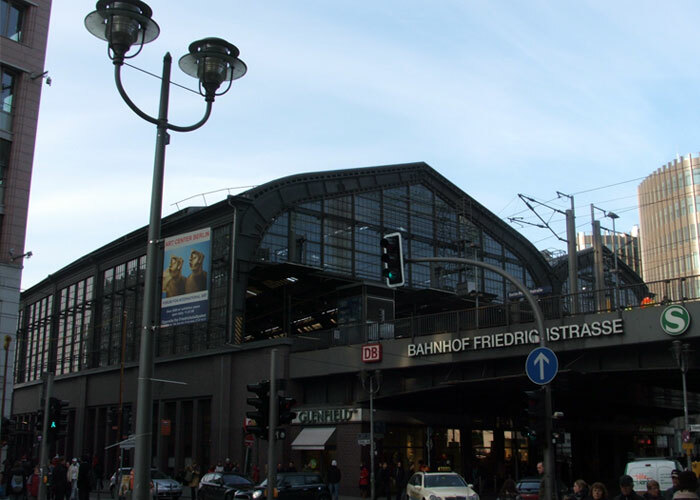 The major artery that is Friedrichstraße, pumps directly from the heart of Berlin. 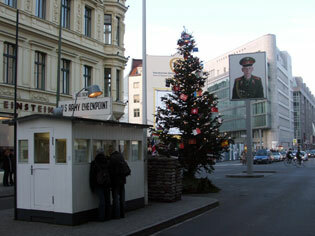 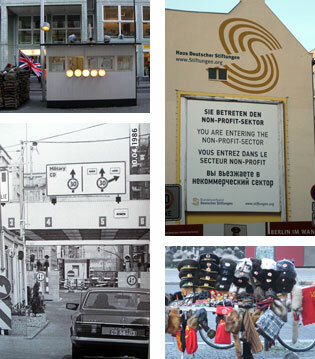 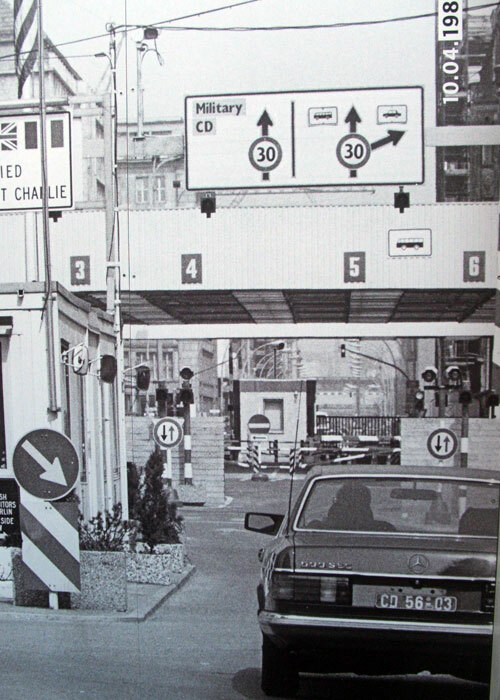 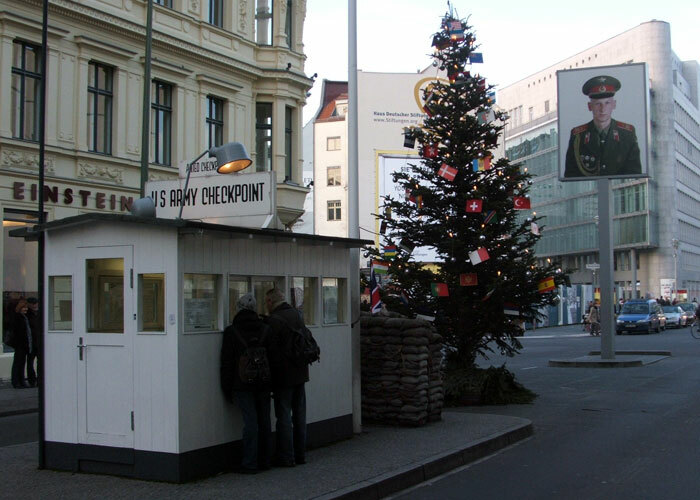 Crossing the Unter den Linden down to Checkpoint Charlie, Friedrichstraße is the Mitte ‘center’ of the city. 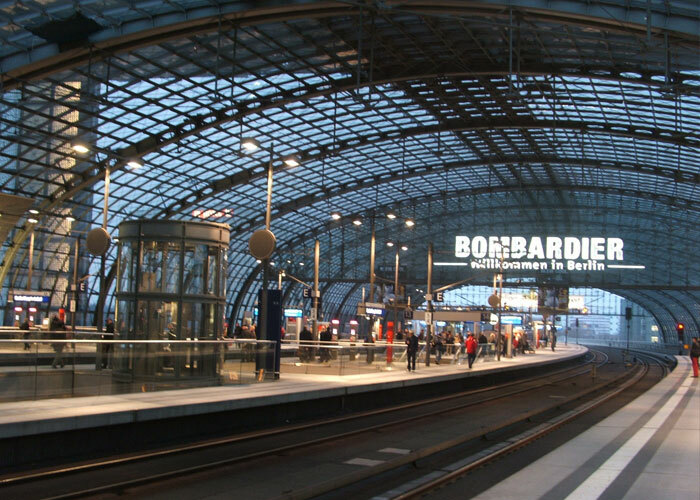 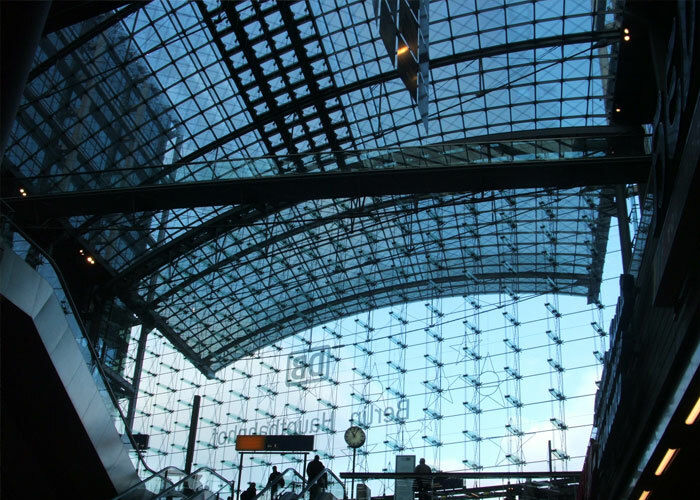 The Bahnhof feels like a second home and connects to virtually every outer limb of the city. 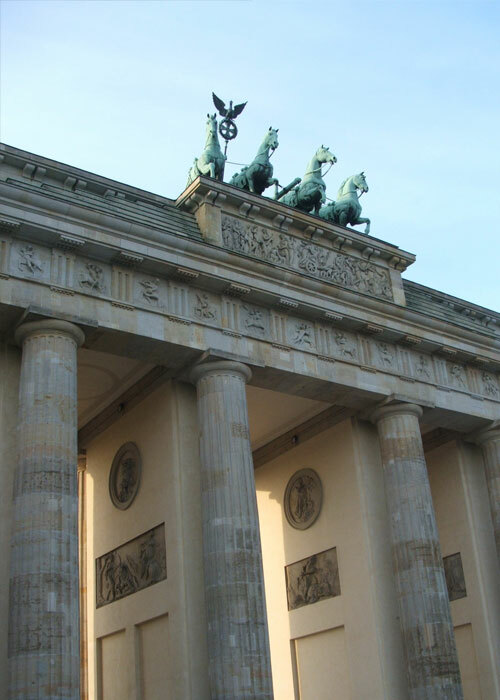 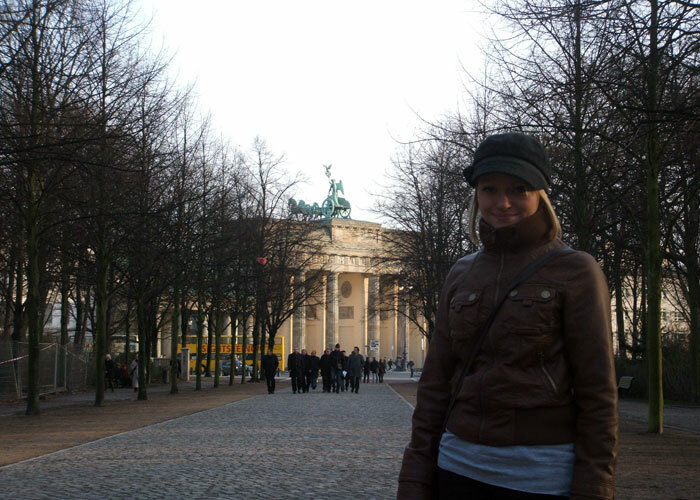 One of the most iconic symbols of Berlin, Brandenburg Tor has seen many trails and tribulations to withstand the last 200 years. 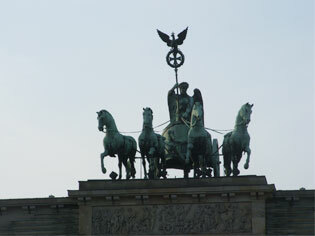 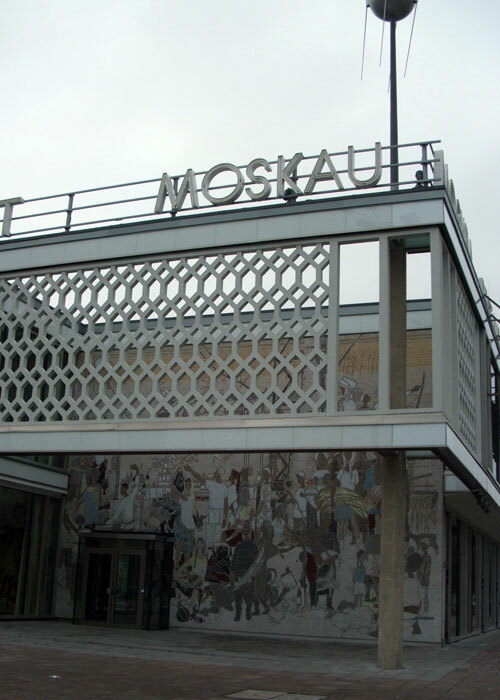 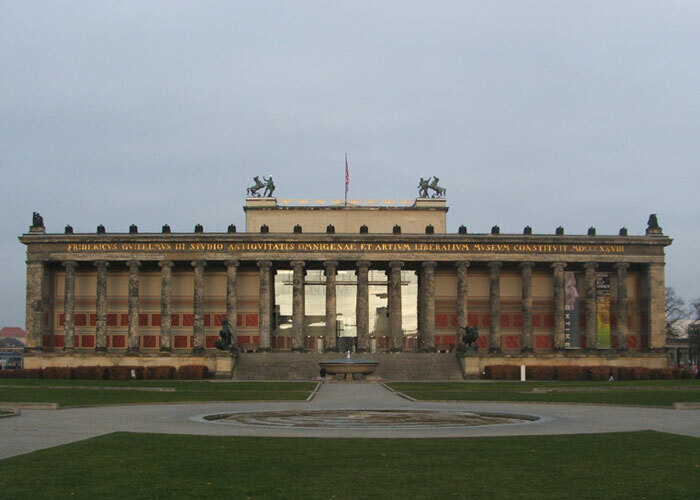 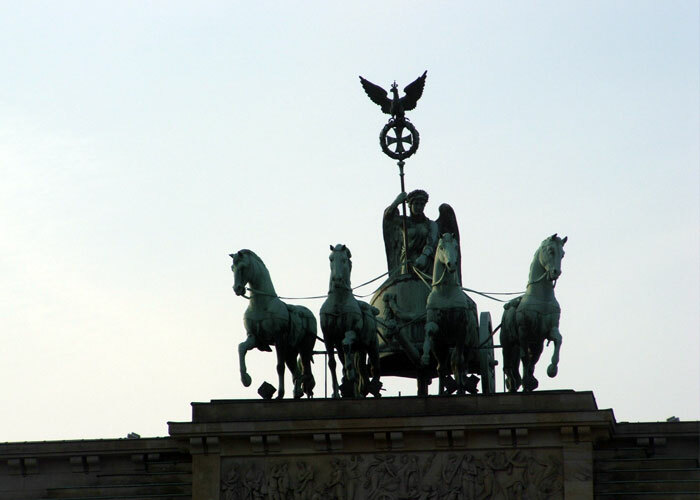 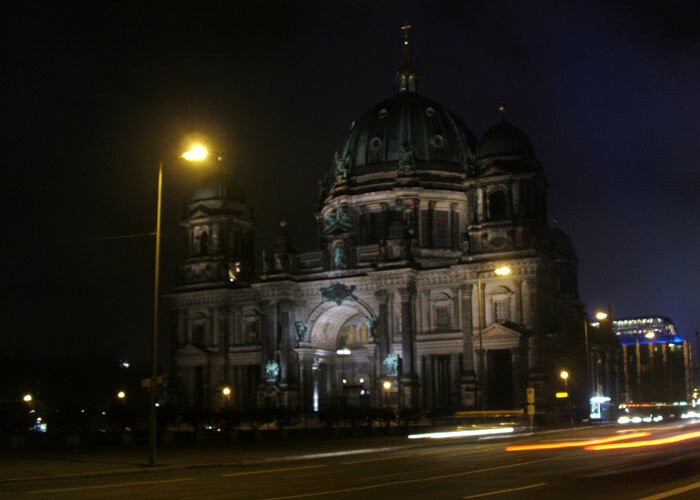 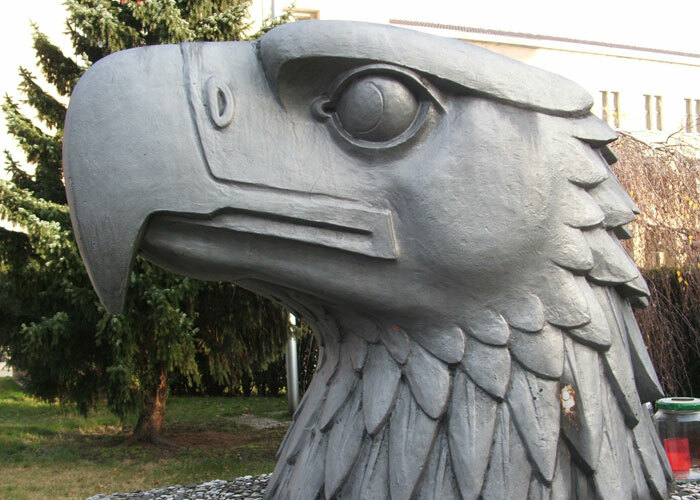 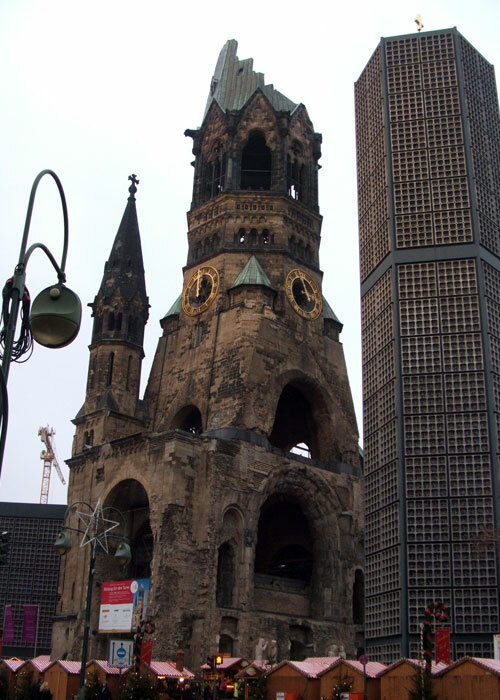 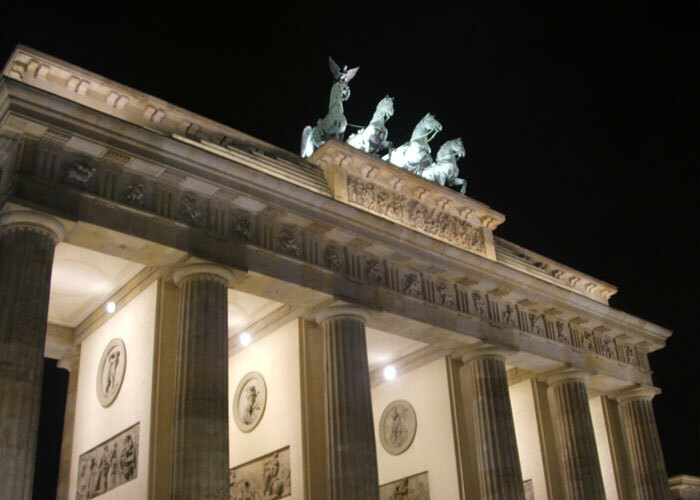 Sitting once in No Mans Lands, just several meters from the Berlin Wall, this Prussian masterpiece sits proudly at the crossroads of Berlin, free for all to visit and walk under. 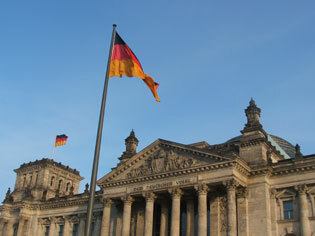 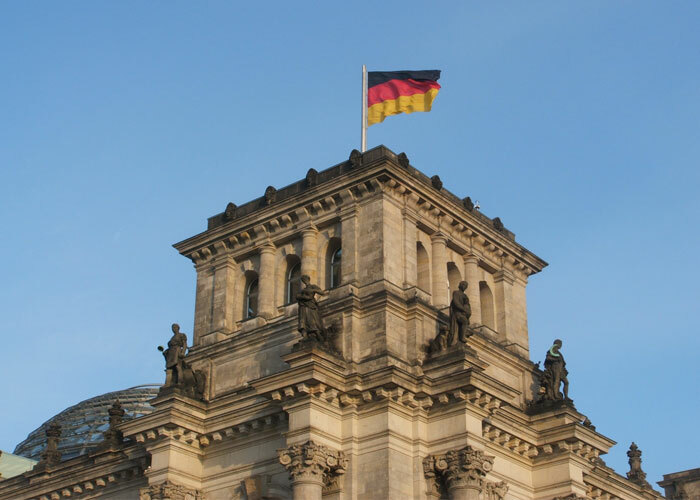 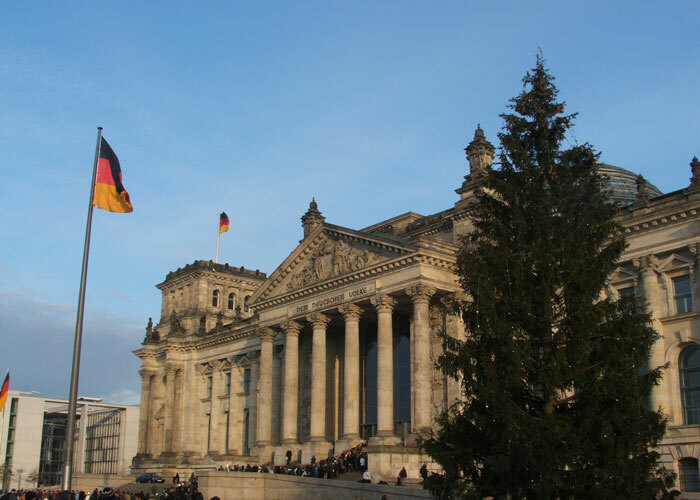 Having survived a Fire, Allied Bombs and rampaging Russian soldiers, the Reichstag is once again at the heart of a united Germany. 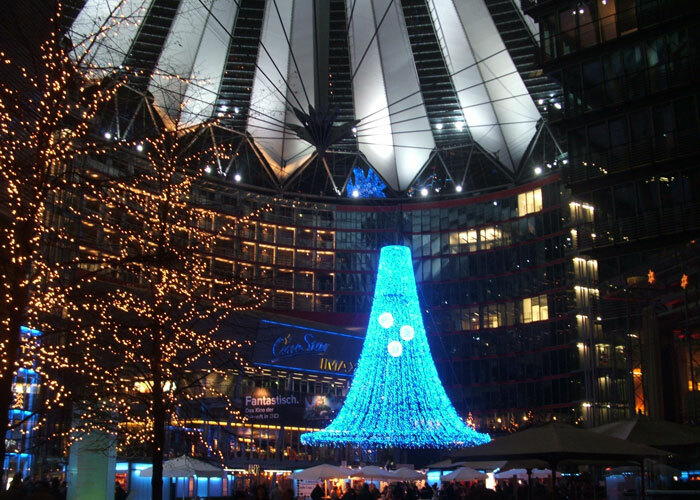 Once again the queue to visit the Norman Foster built glass dome was long and static, so we decided to give it a miss this time and warm up with some gluhwein! 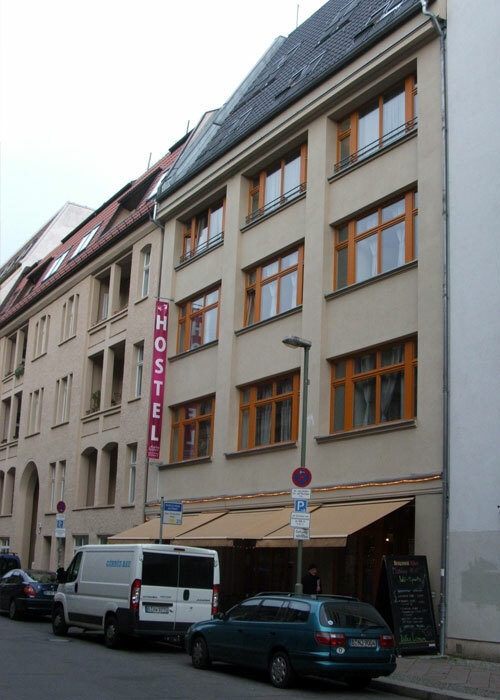 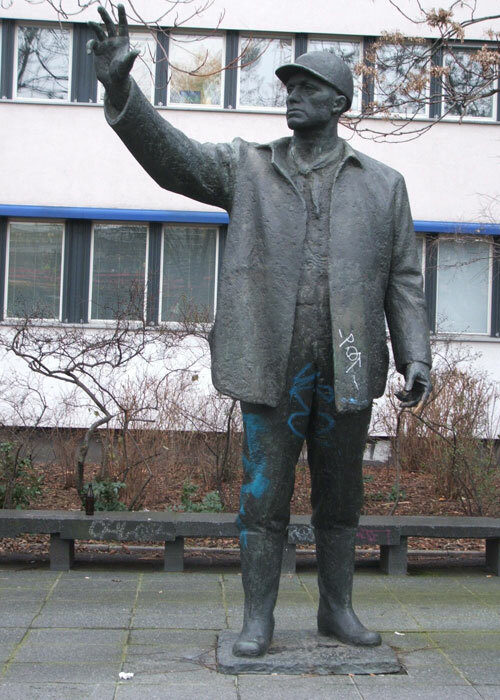 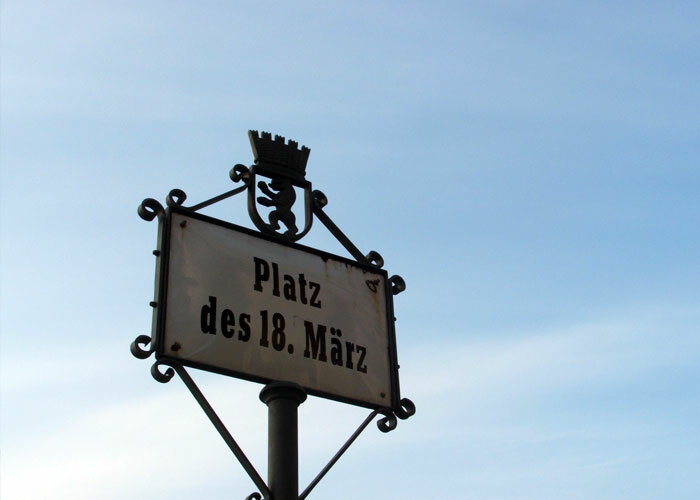 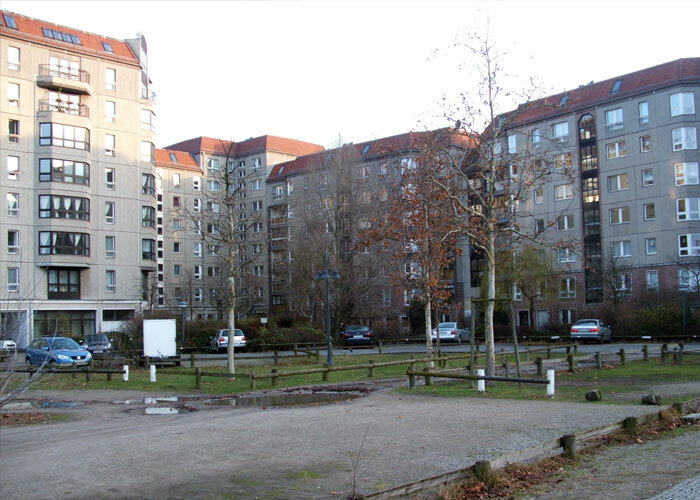 Once the political and administrative zone of Prussian / Nazi Germany, the street still harbours several ghosts of the past. 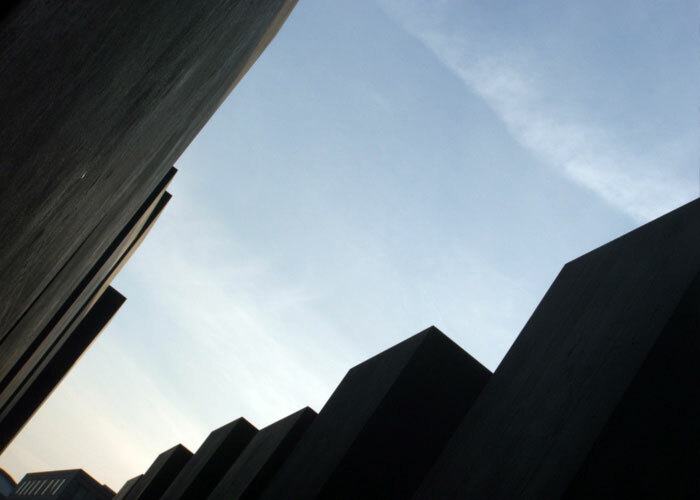 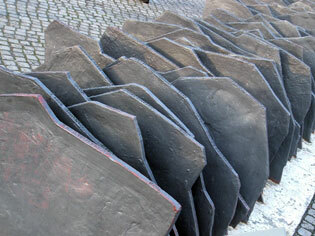 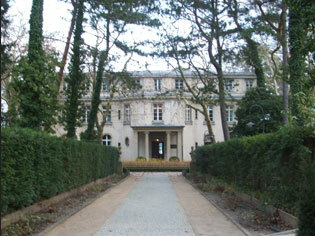 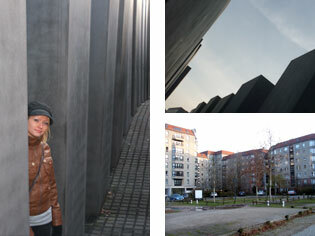 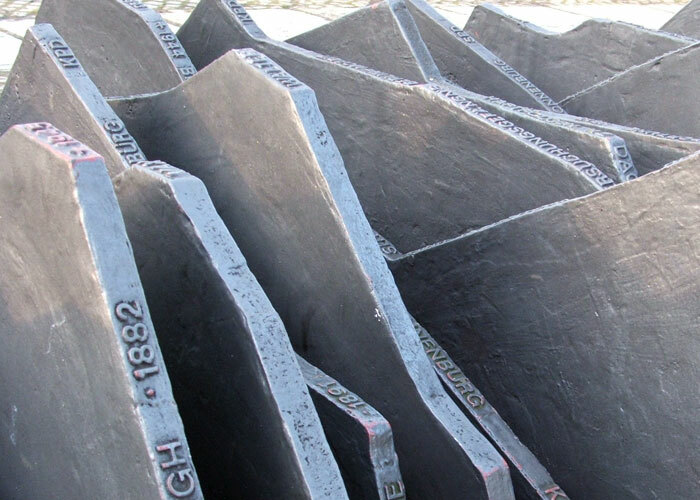 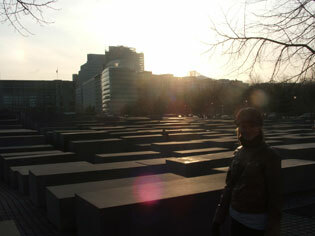 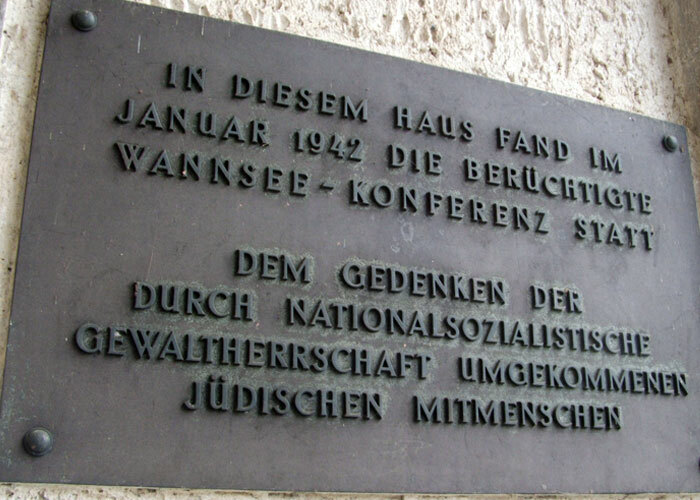 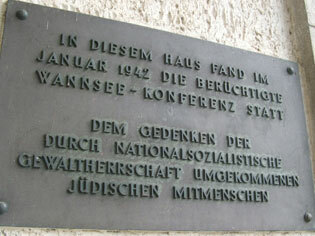 The eerie Jewish Memorial sits a block behind the street, on the site of former Fuehrer Bunker. 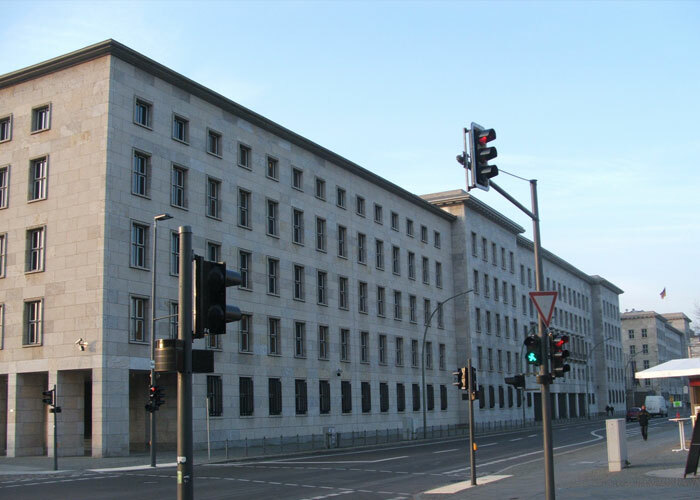 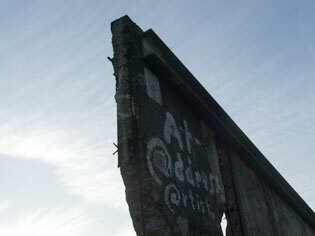 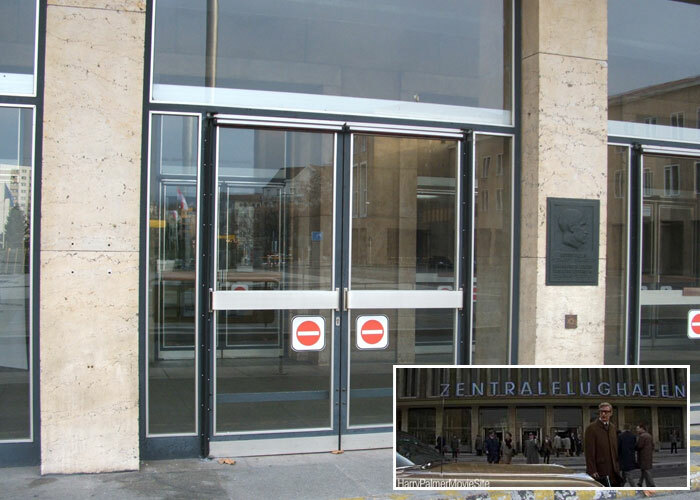 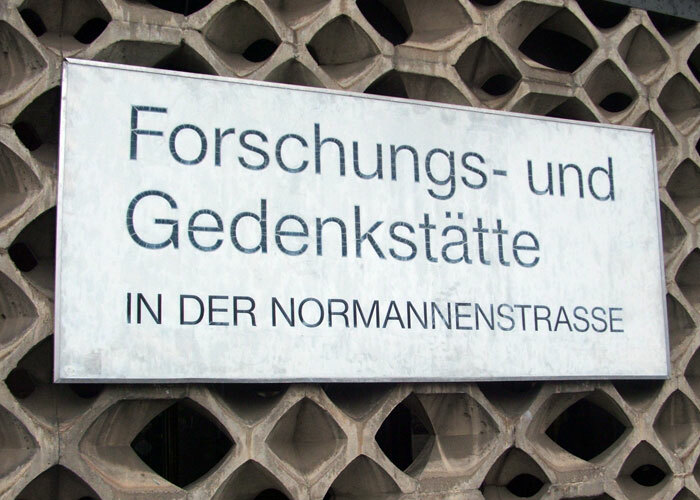 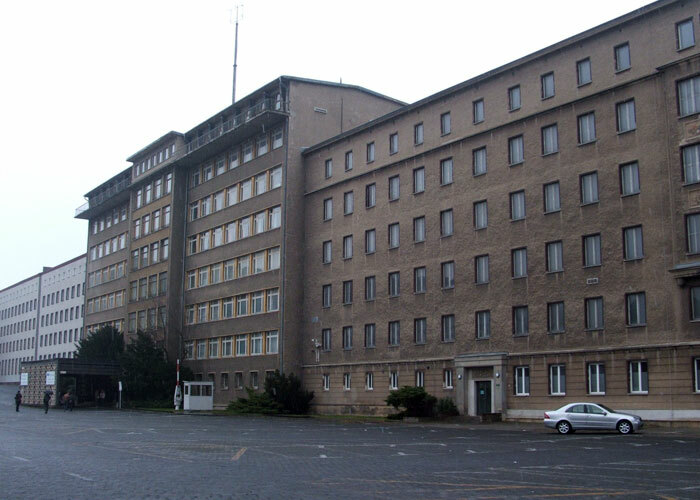 Further down the street are the Reich Air Ministry, site of the Gestapo HQ and even remnants of the Berlin Wall. 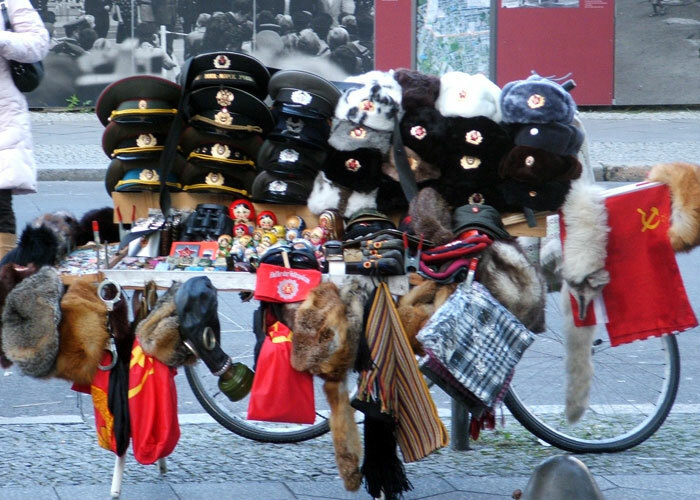 The Checkpoint Charlie money making operation continues in full swing, with replica DDR hats, flags and genuine bits of the Berlin Wall. 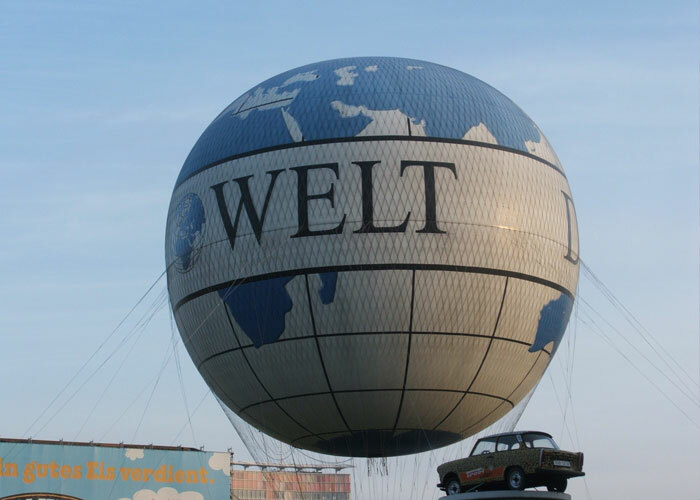 Allegedly, the Berlin wall would have travelled three times around the globe to provide the salesman still peddling parts of it! 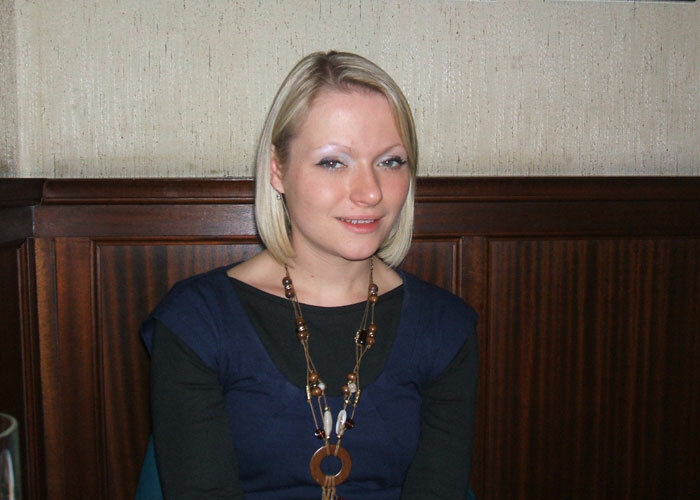 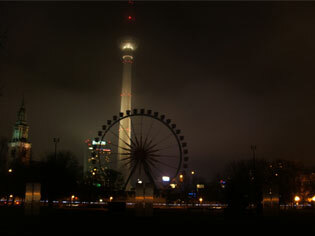 Despite having changed drastically, it still provides a good photo opportunity. 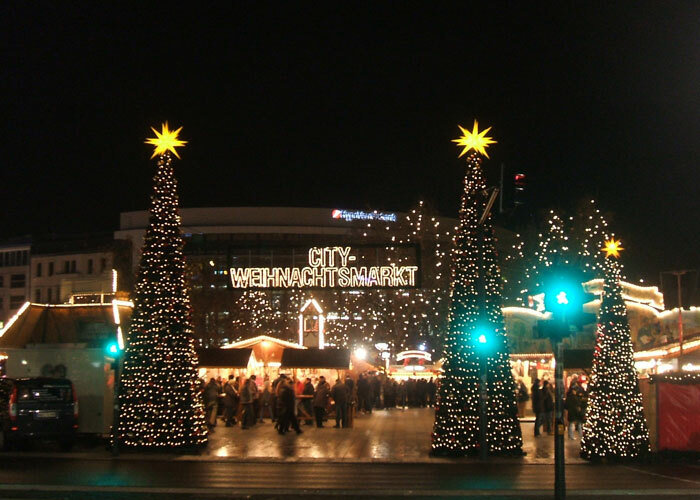 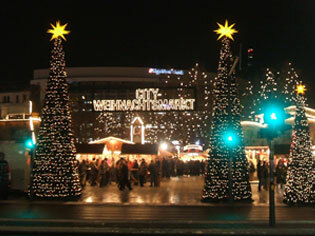 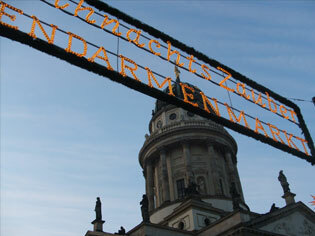 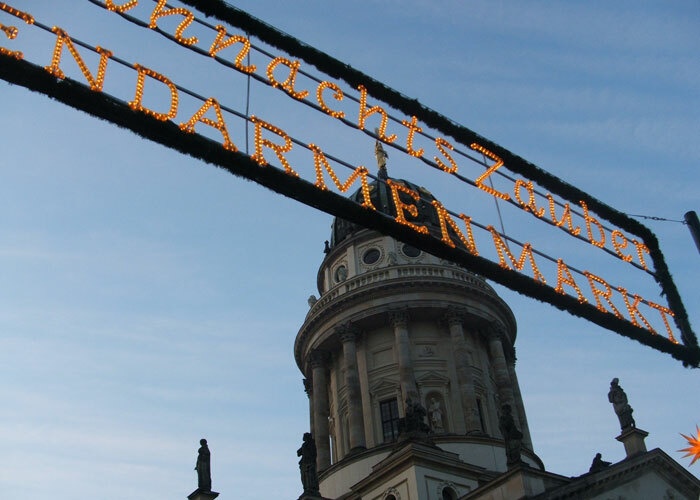 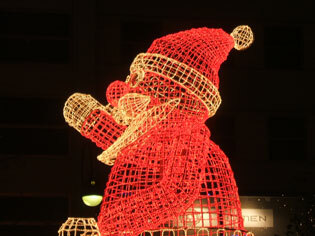 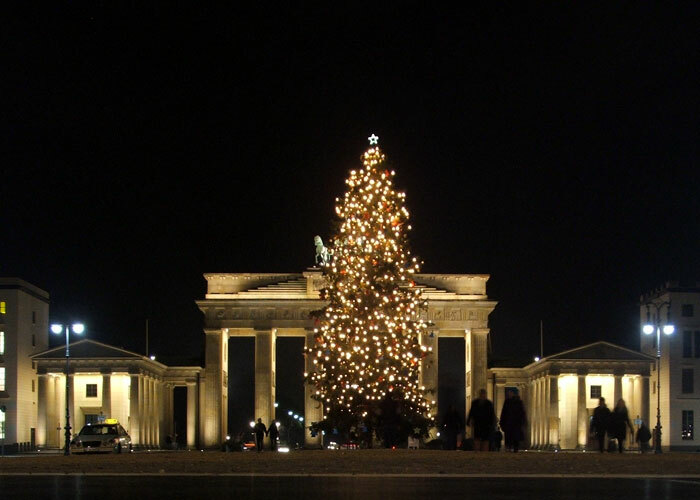 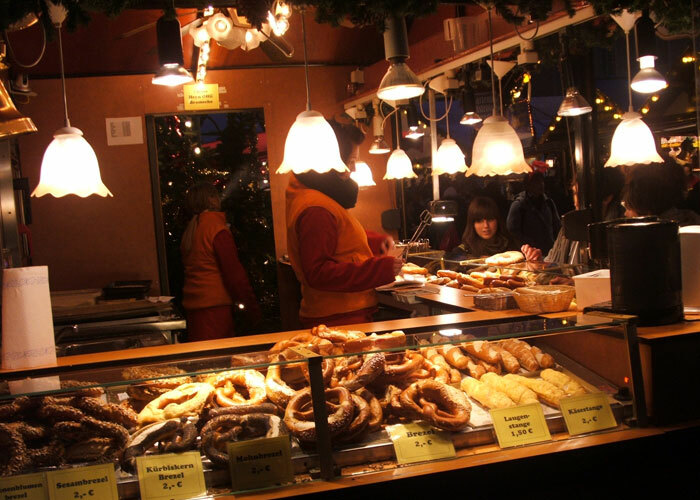 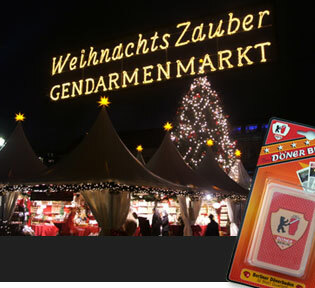 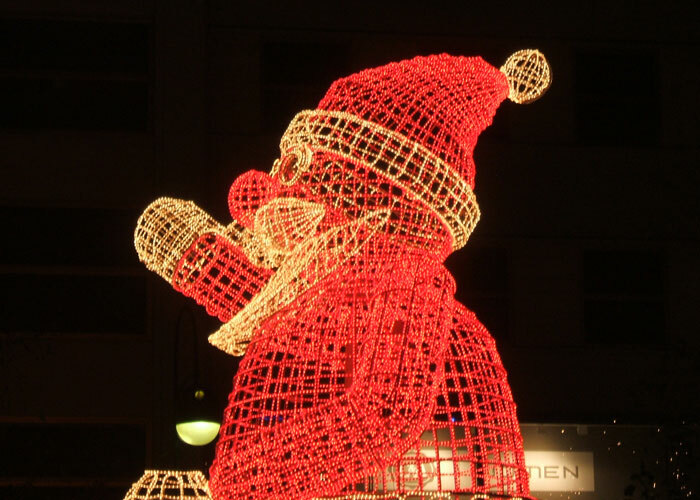 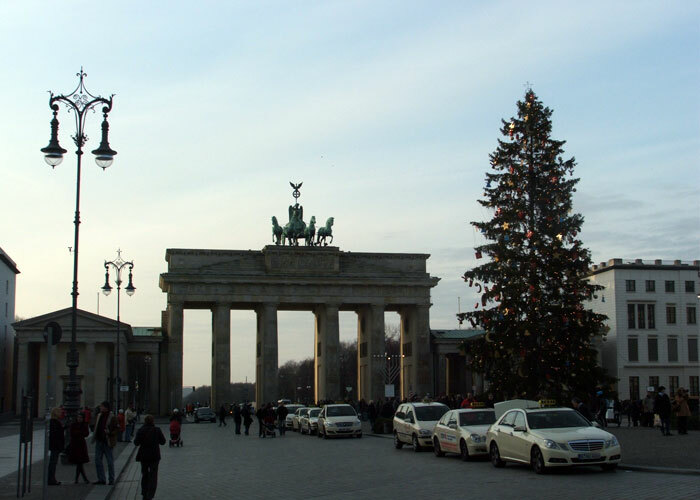 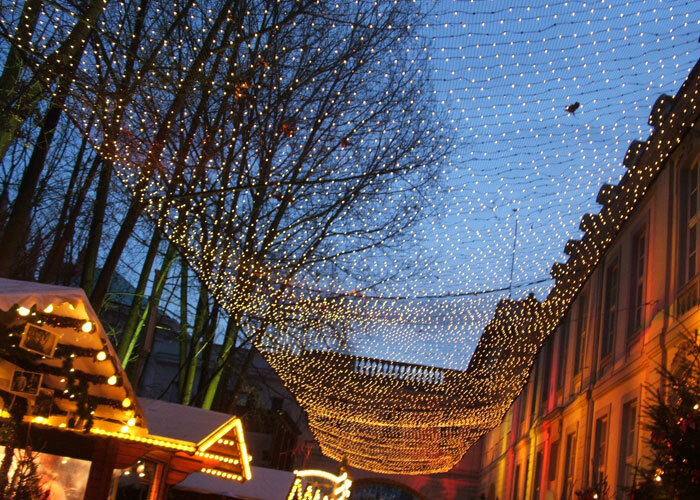 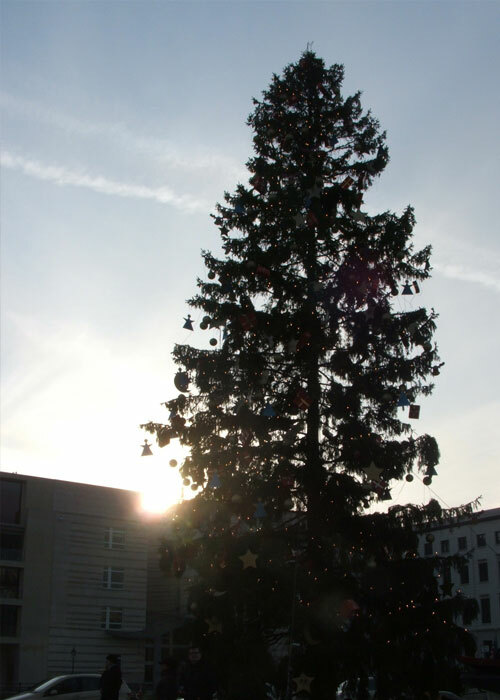 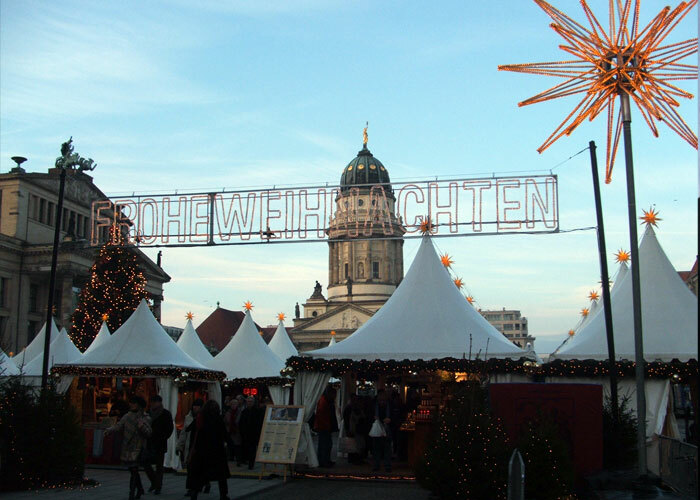 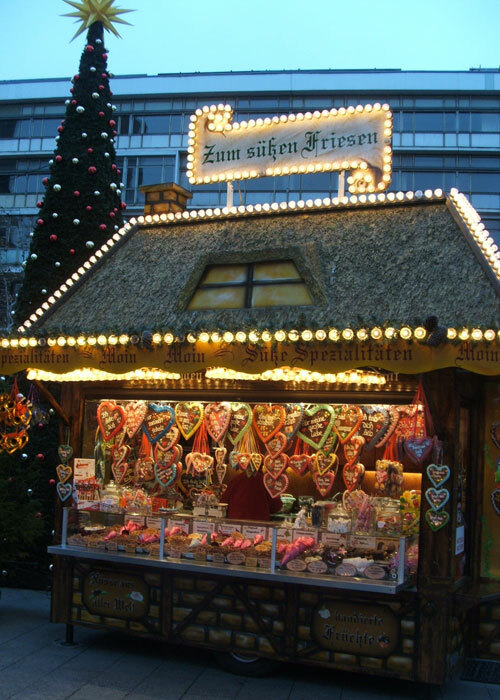 The Huguenot built Gendarmenmarkt provided a festive backdrop for Gluhwein and Bratwurst. 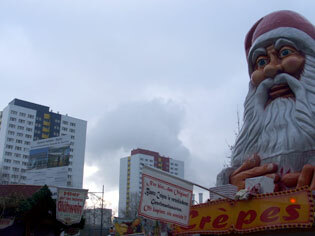 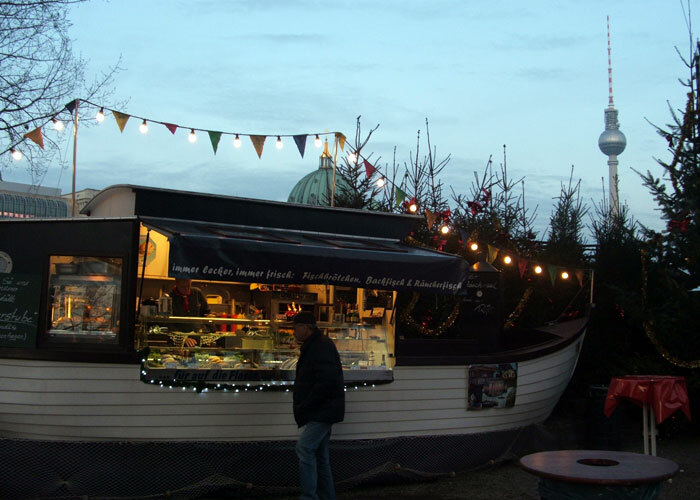 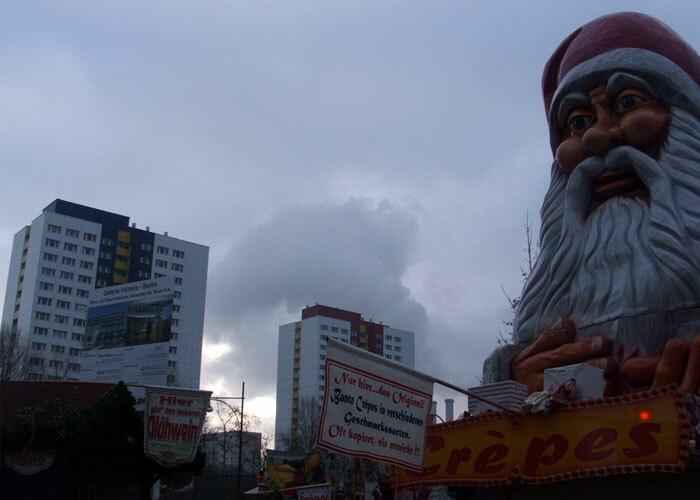 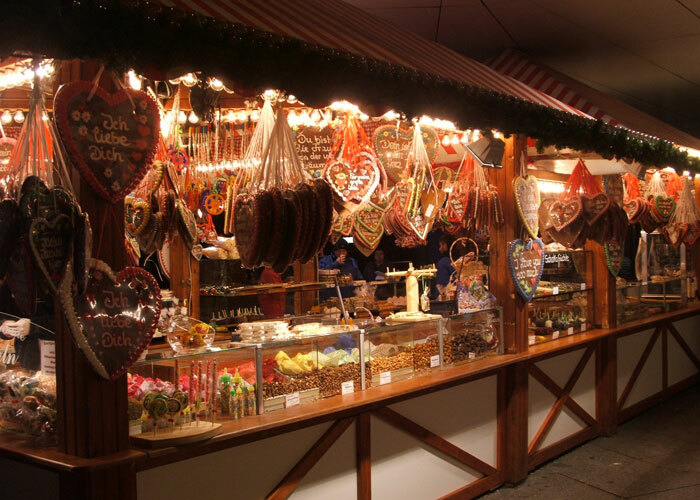 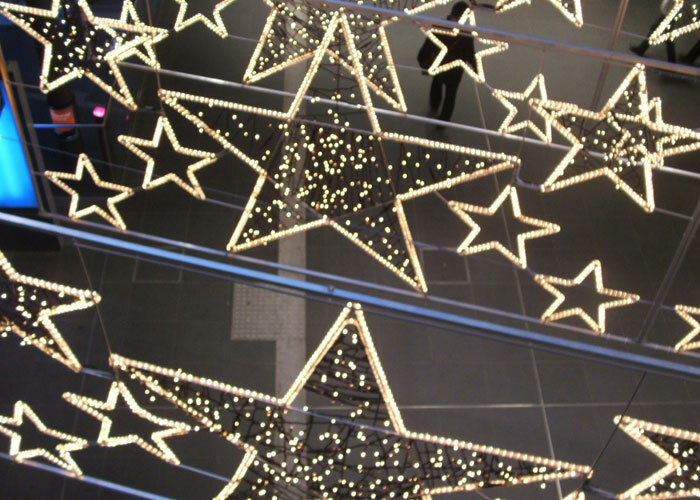 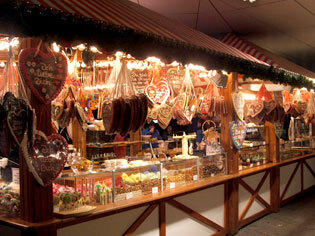 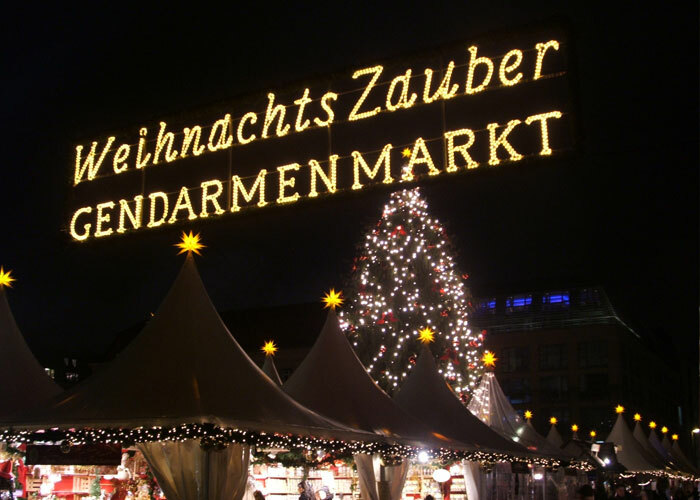 The Christmas Markets were not in full swing as locals poured into them after finishing work for the weekend. 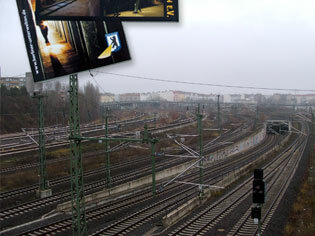 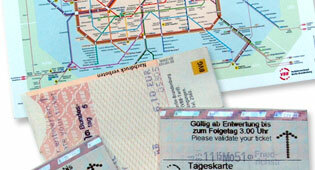 GESUNDBRUNNEN provide two points of interest. 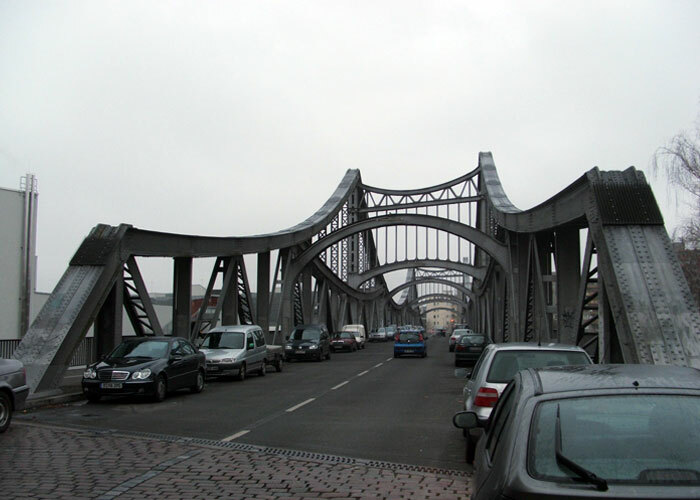 Firstly the Swinemünder Brücke was the setting for the coffin exchange scene in the Michael Caine film, ‘Funeral in Berlin’. 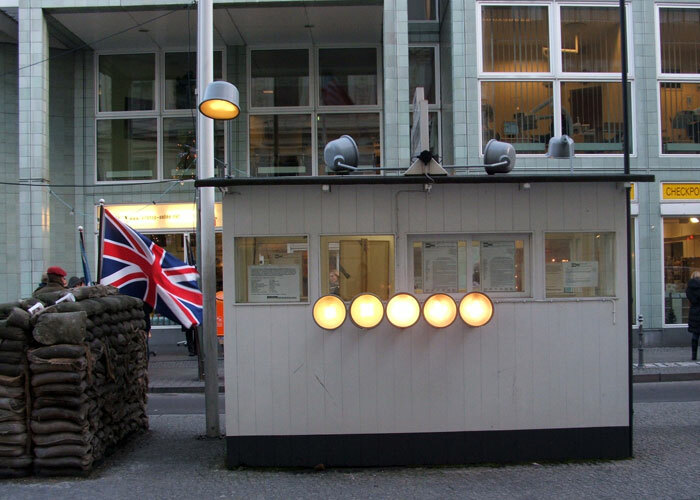 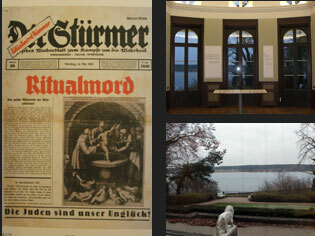 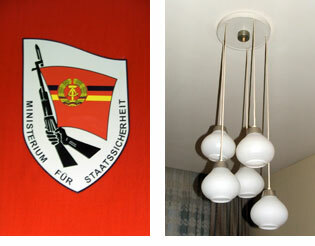 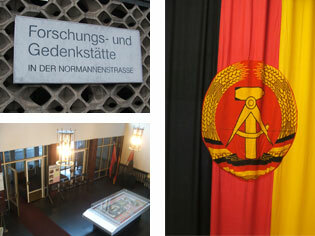 Secondly, the partially restored WW2 civilian bunker in Gesundbrunnen U Banhhof, provided a mini time warp. 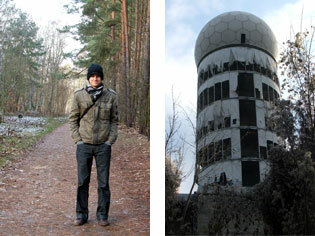 The atmospheric concrete bunker is worth a visit if you have time. 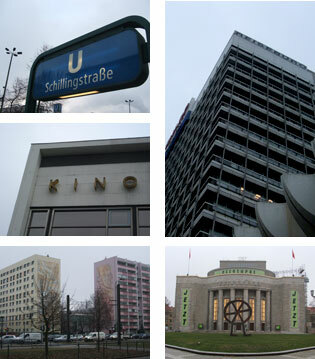 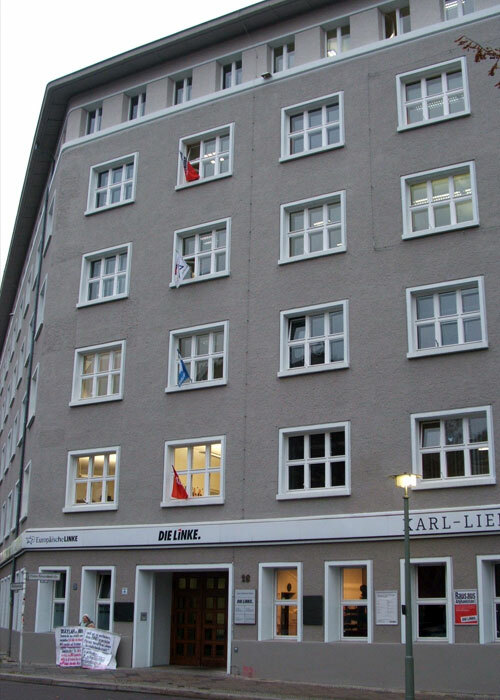 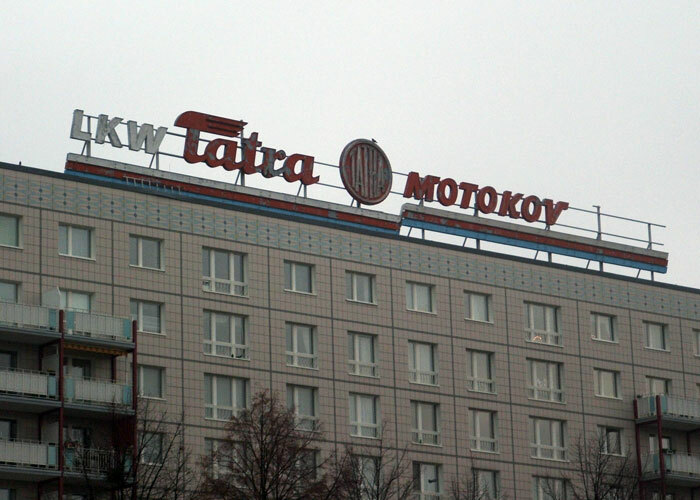 Having left the north of Berlin, we travelled east along U5 under the miles of post war communist apartment buildings that make up Karl Marx Allee. 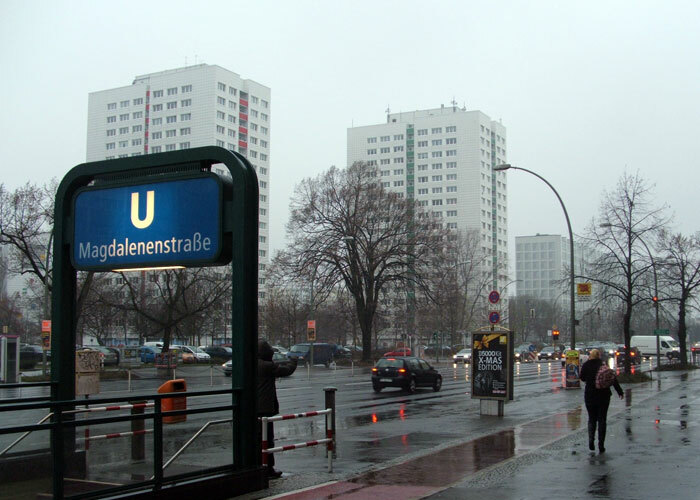 We exited the U bahnhof and not only had the architecture changed but the WEATHER had closed in, with snow starting to fall quickly. 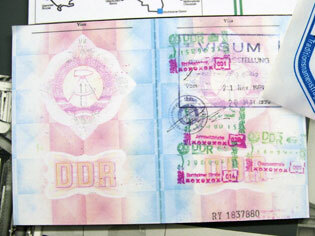 Twenty years ago our next location to visit wasn’t even marked on a map. 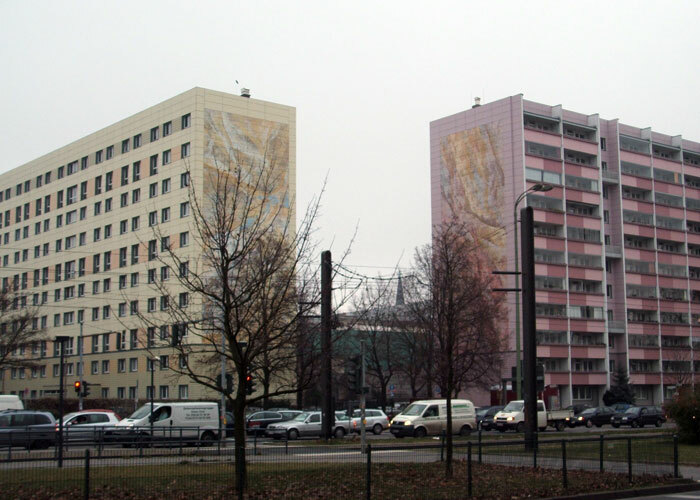 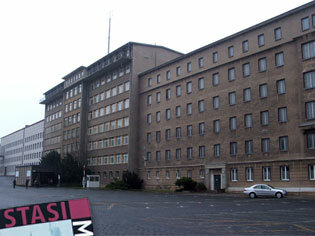 The MfS buildings in Lichtenberg, once the infamous HQ of the Stasi, now sit somewhat deserted. 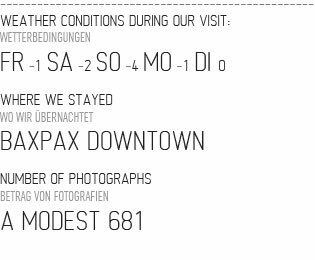 As the only English speaking visitors that day, we wondered the various floors somewhat alone, picking out keywords from my ‘pigeon German’. 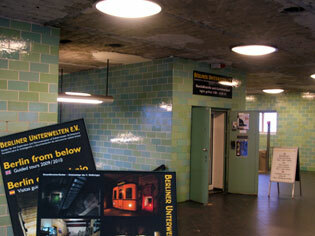 It’s undoubtedly an eerie place, full of ghosts of the past, with many original fixtures and fittings still on show. 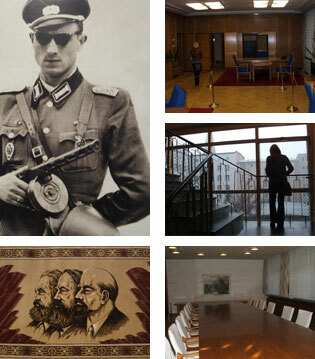 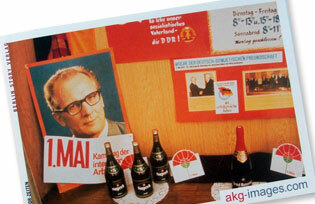 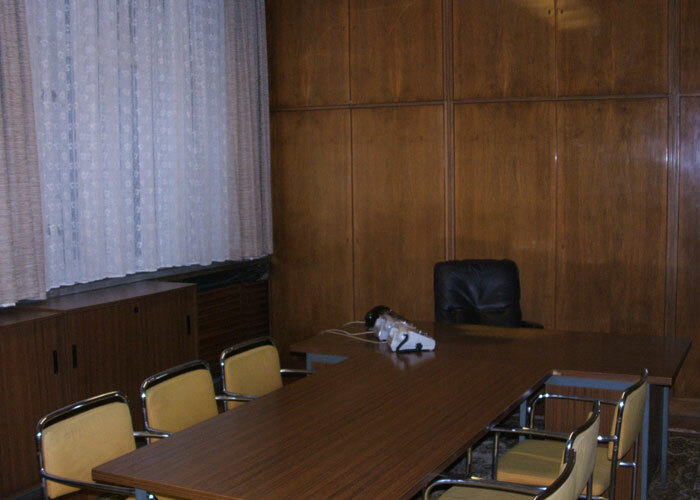 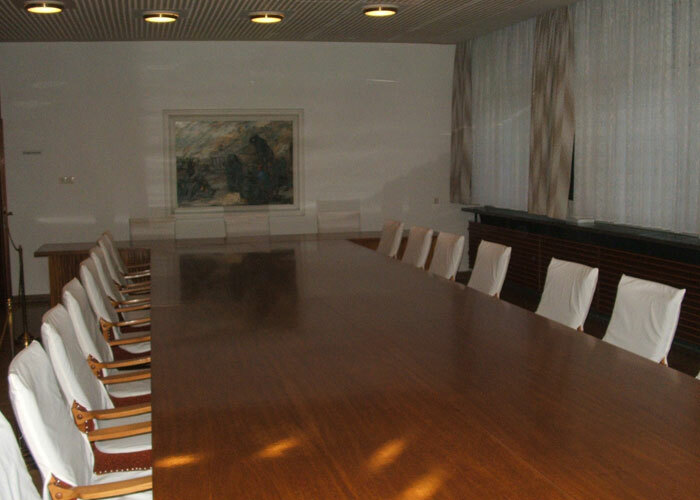 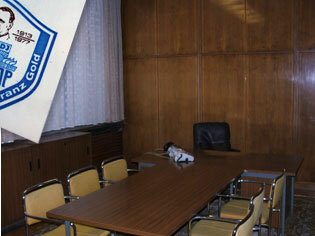 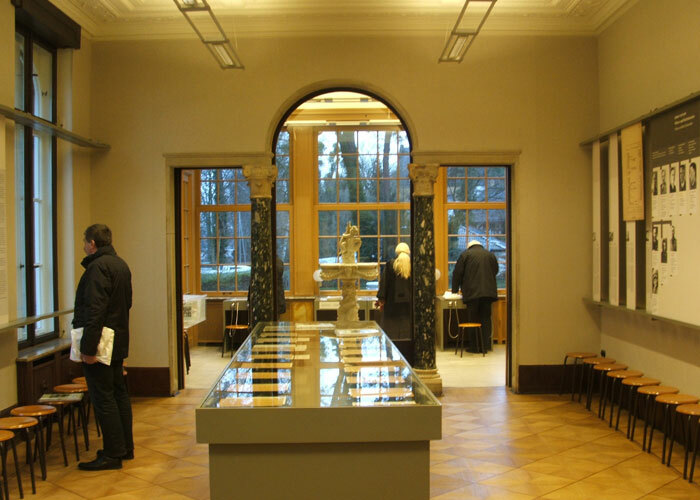 The most surreal though is Mielke's offices. 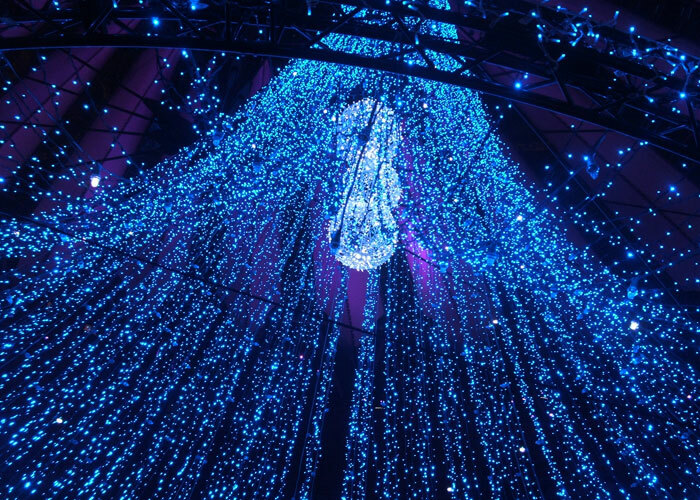 In fact the whole of the Upper 1st floor gave off the most surreal sensation, with the snow falling outside, no one else around, it felt like a mini time warp with eyes of the past upon you. 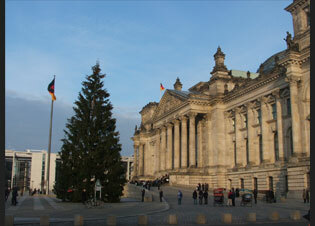 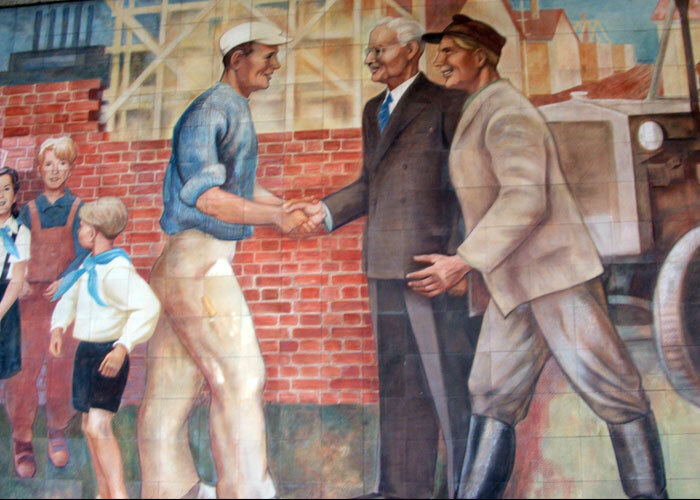 The former city centre of the east, ‘Alex’ as its simply known by natives retains much of its pre unification persona. 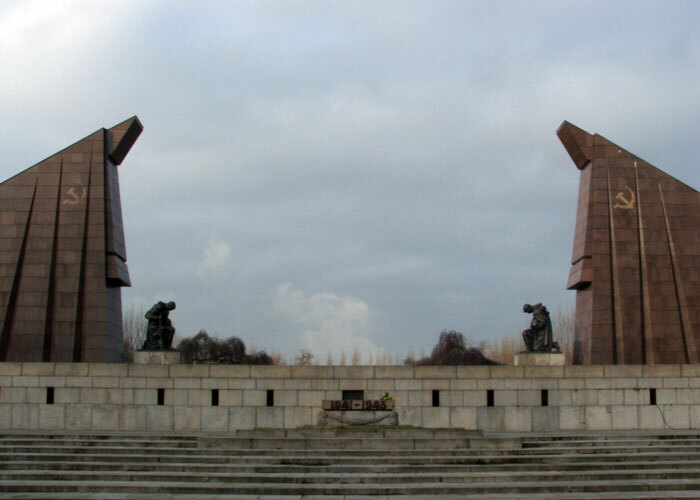 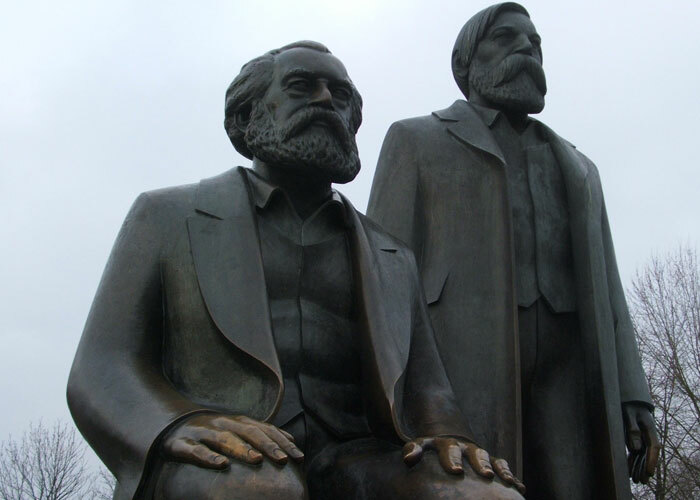 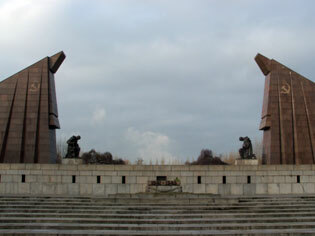 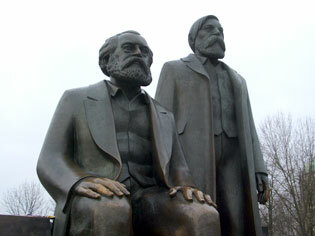 Messrs Marx and Engels still sit proudly in the park, although the backdrop of the Palace der Republik is no more. 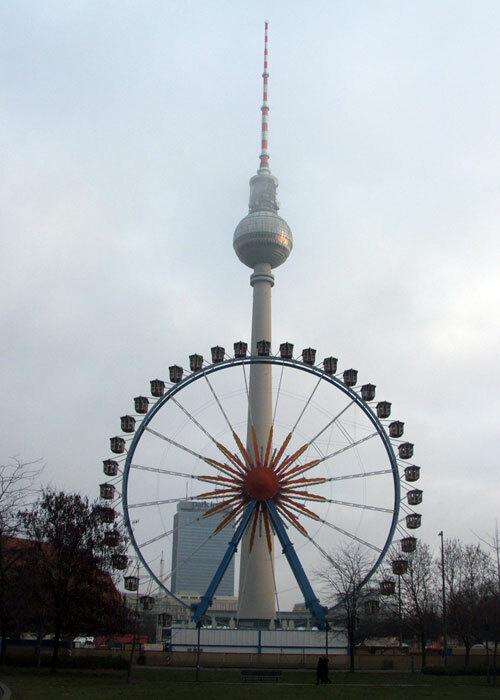 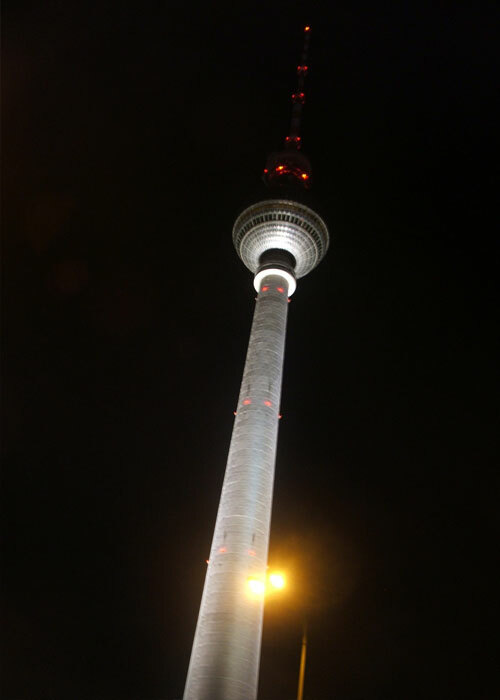 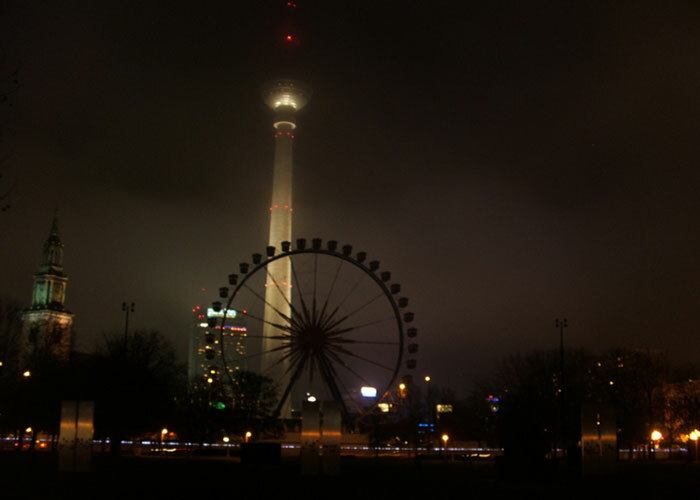 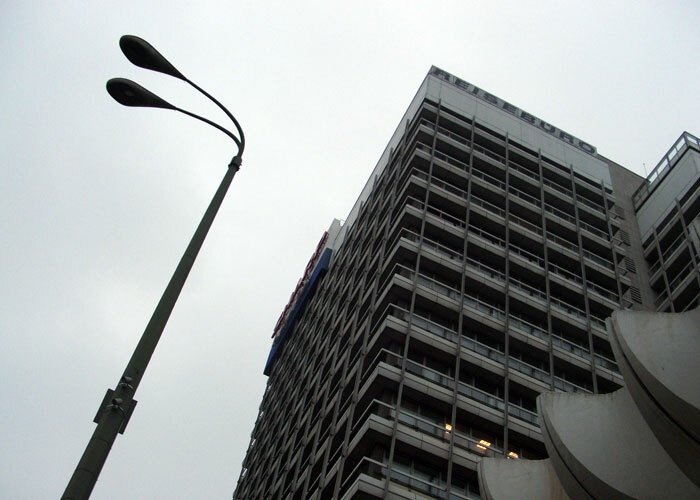 The Iconic Fernsehturm still acts like a homing beacon to this former Socialist Utopia. 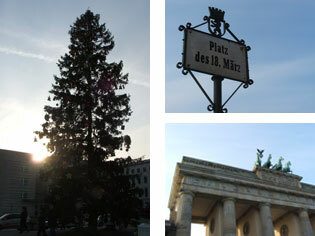 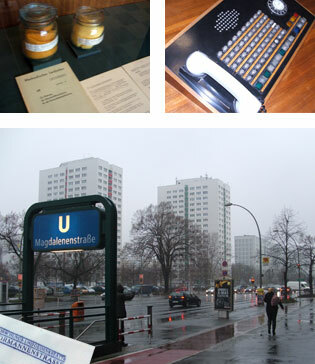 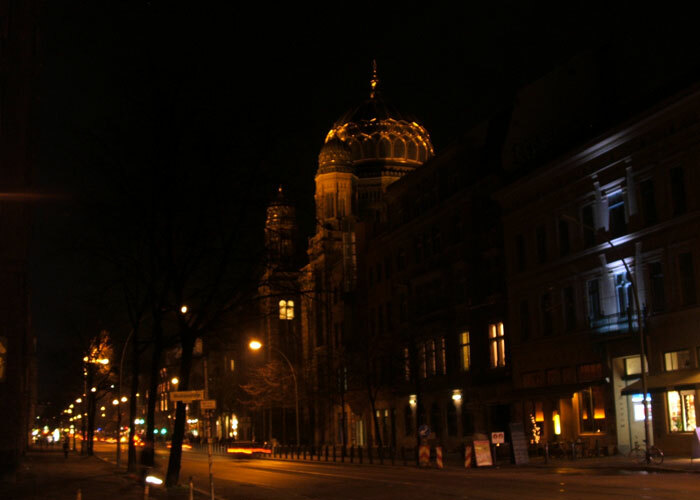 Saturday Night meant a trip up west, across into the whole heartland of West Berlin, the Kurfürstendamm. 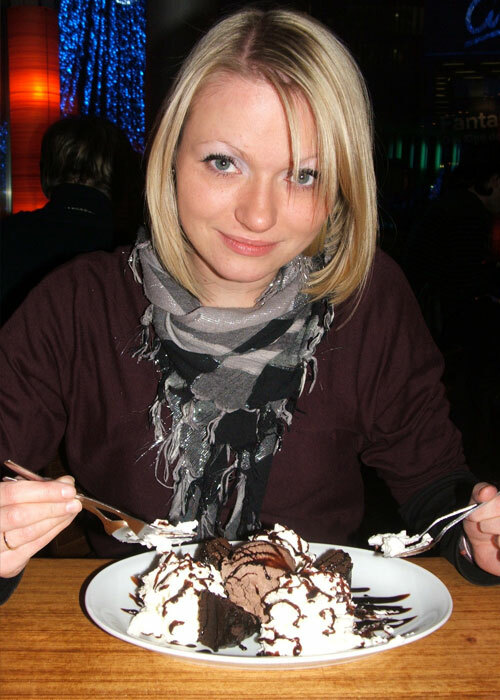 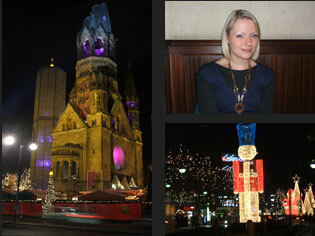 We found a great little German restaurant, where we had to wait for 25 mins for a table, but it turned out to worth it. 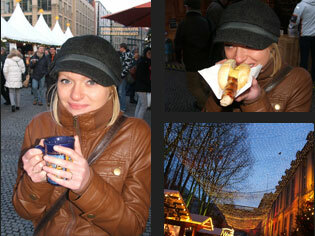 Mashed Potato, Roast Pork and red cabbage washed down with a couple glasses of draft Berliner. 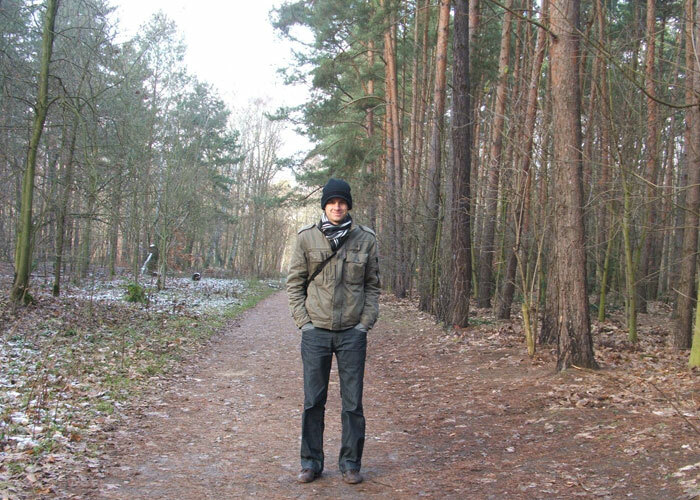 Sunday Morning and a trip to the woods. 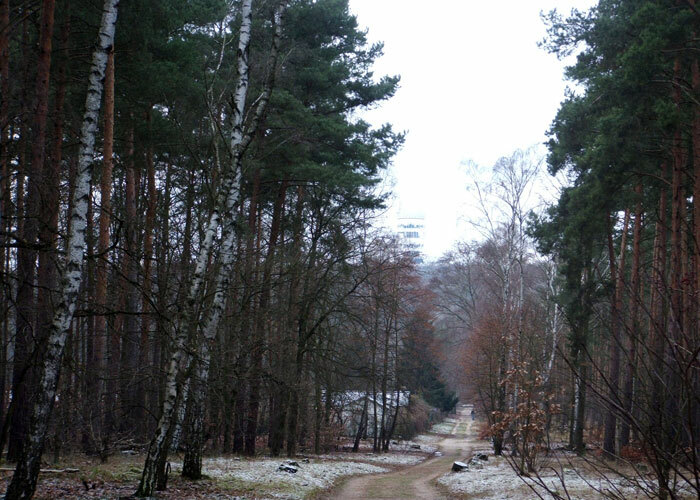 The GrunEwald to be precise. 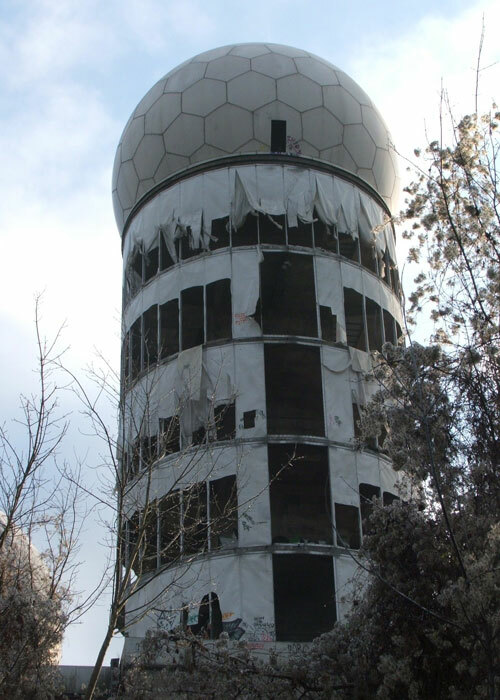 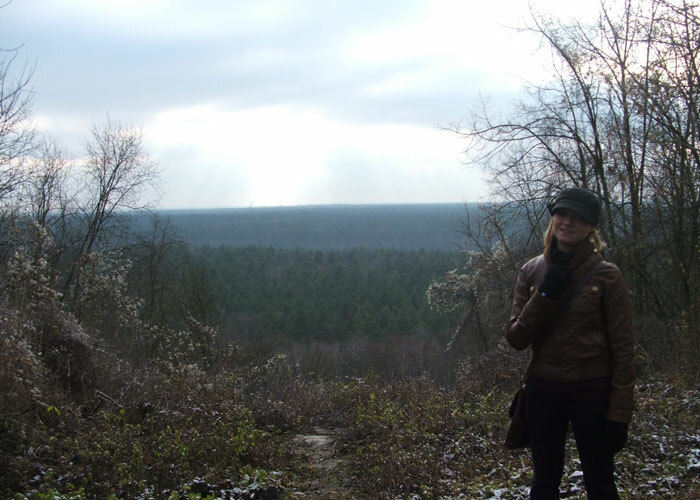 Having climbed the artificial hill that is known locally as TUEFELSBERG (Devils Mountain), we wondered the parameter of the former US Listening station perched on the top. 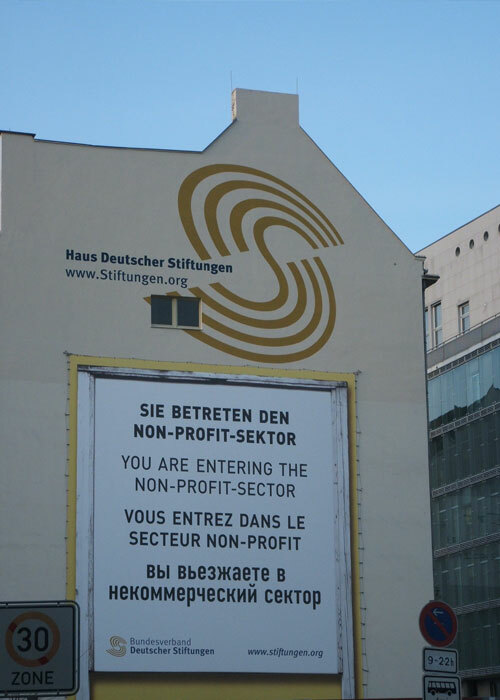 Despite my better judgement we didn’t enter the site. 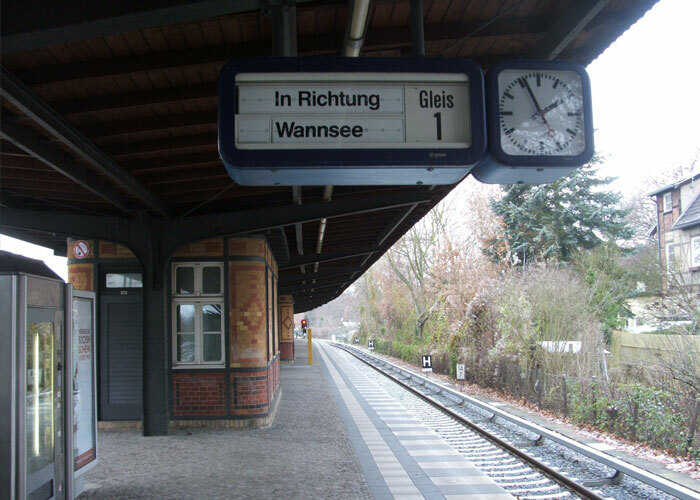 Having jumped on the next train south, we travelled onto the lakeside town of Wansee, to visit the infamous site of the Wansee Conference. 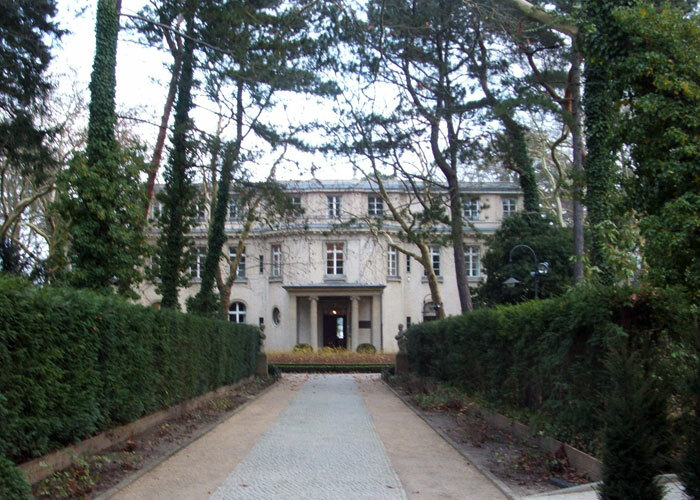 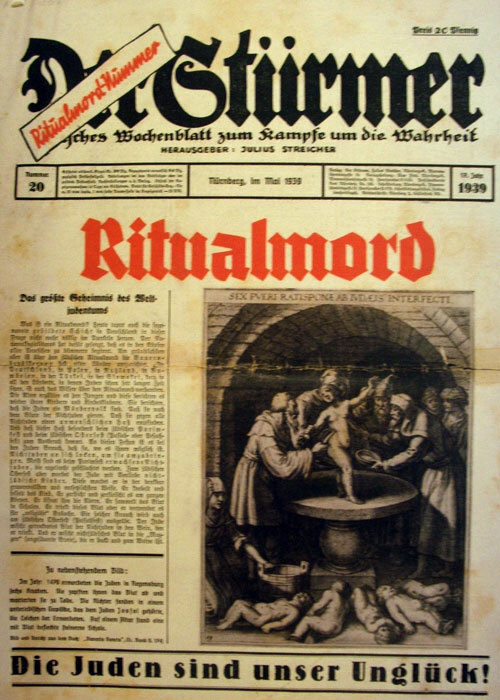 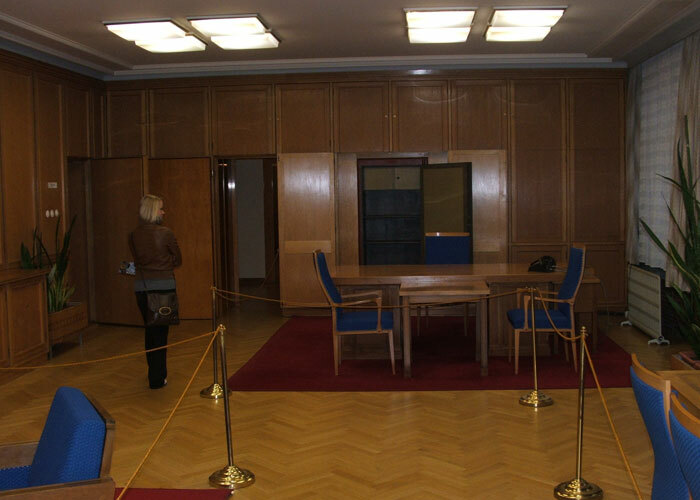 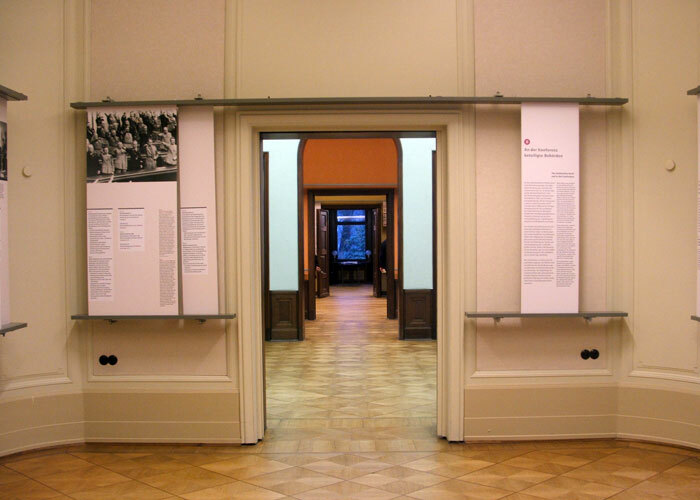 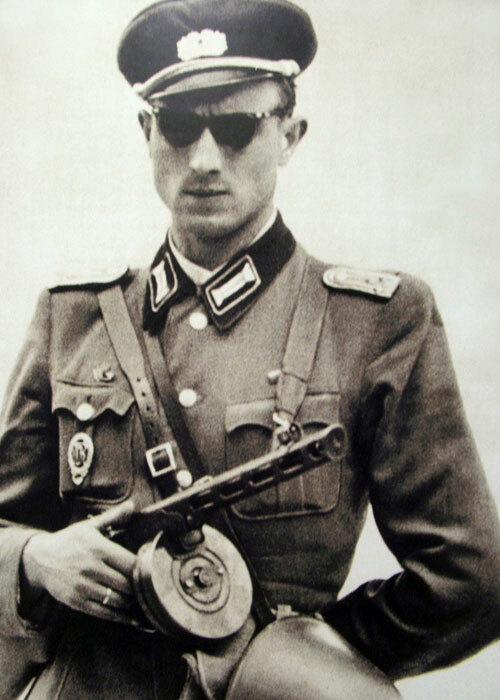 In January 1942, this grand yet unremarkable villa held a 90 minute meeting between high ranking Nazis, that determined the fates of millons of people. 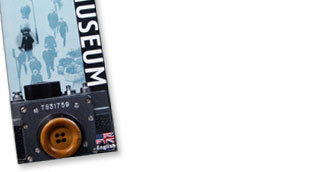 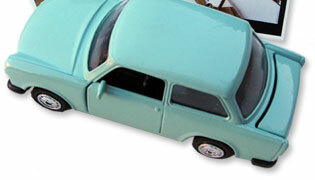 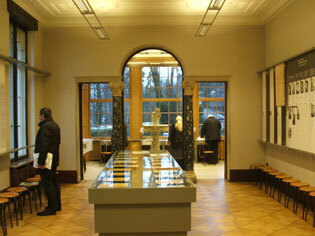 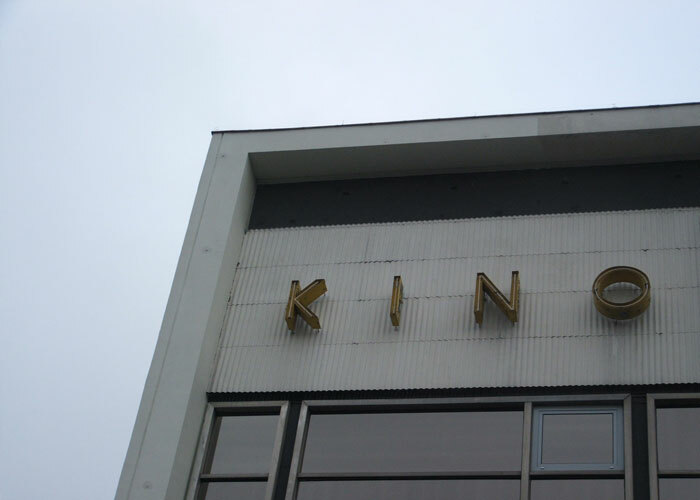 Now a museum, its another relic of the not so distant past. 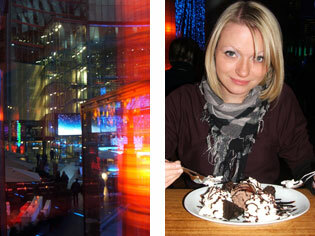 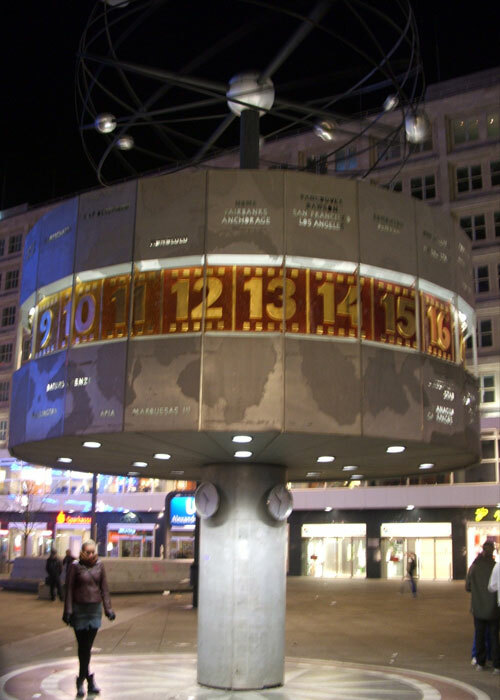 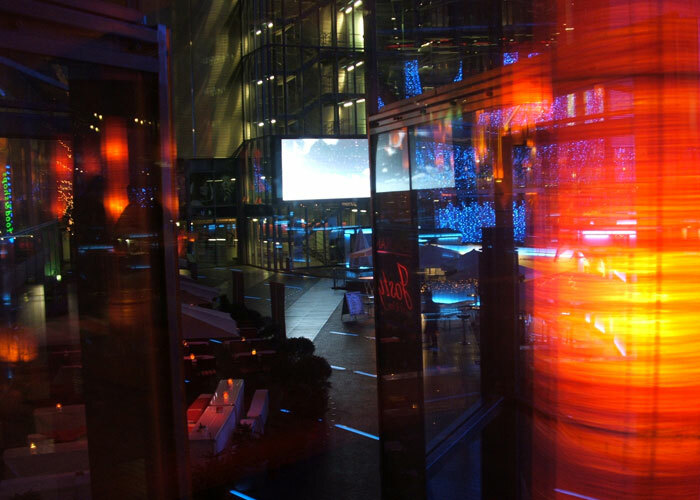 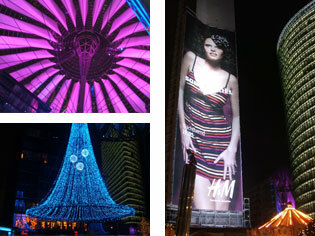 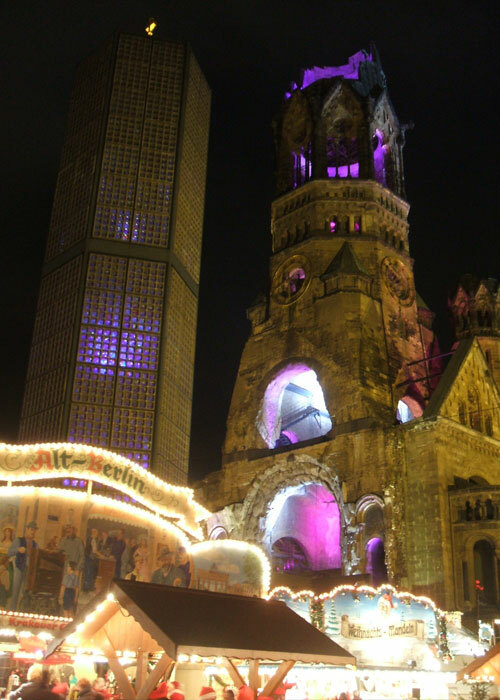 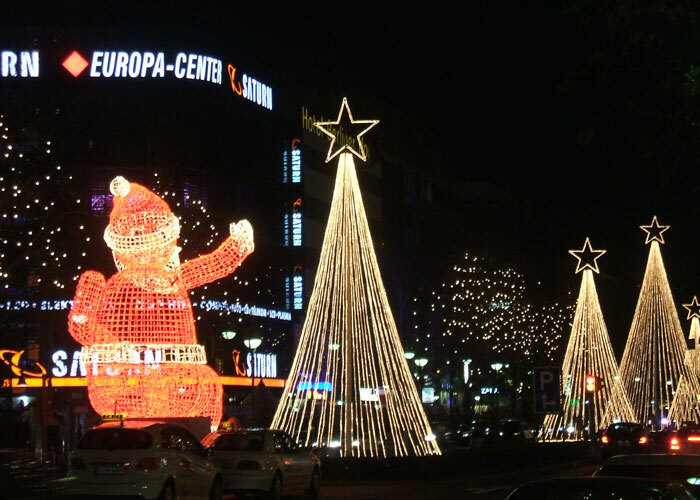 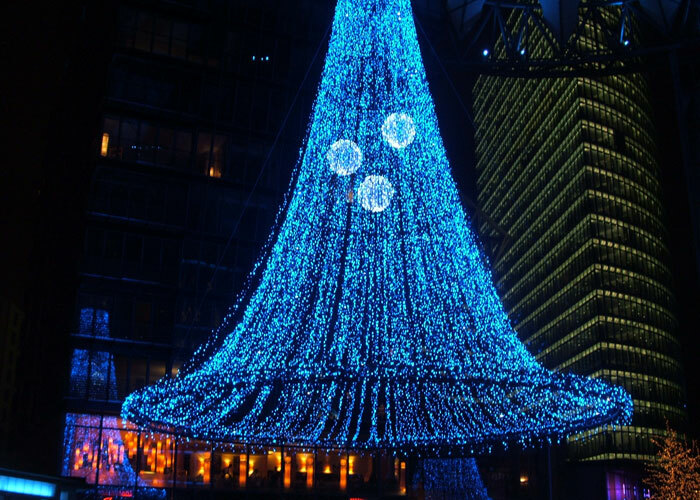 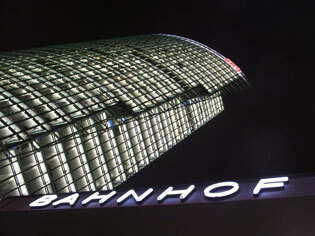 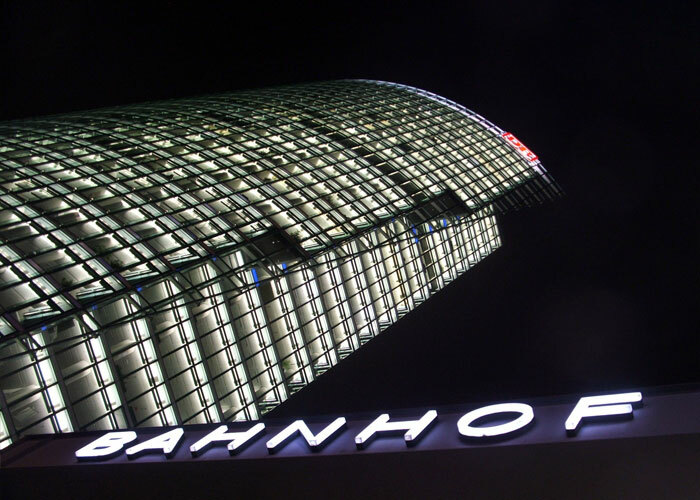 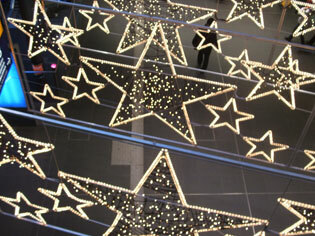 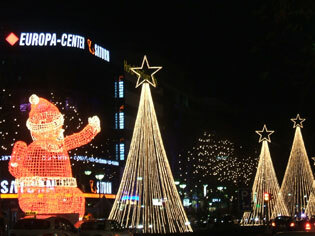 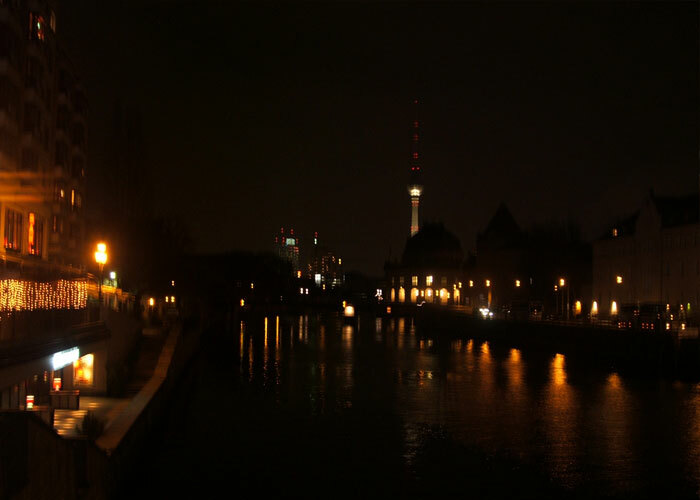 Not just pictures of Potsdamer Platz, but Berlin illuminations at Night. 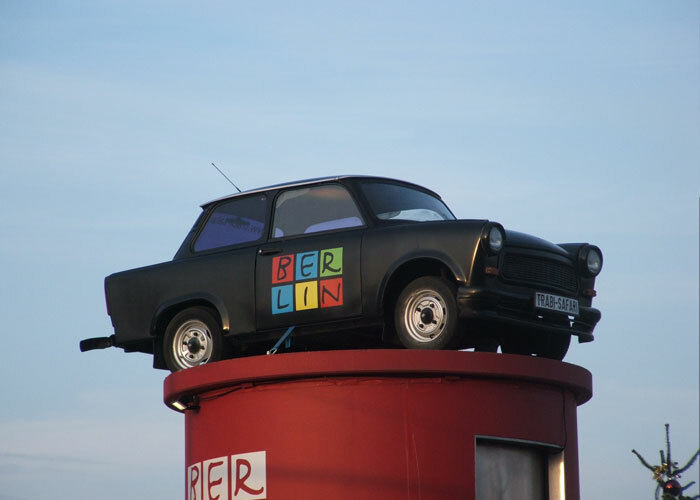 The modern heart of Berlin is a great example of the changing landscape of the city, especially when you think that 20 years ago, it was part of the Berlin Wall death strip! 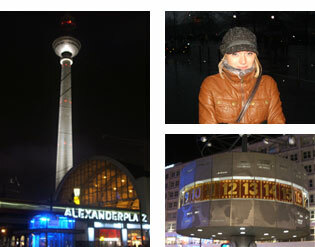 Once again we seemed to hide from the cold there! 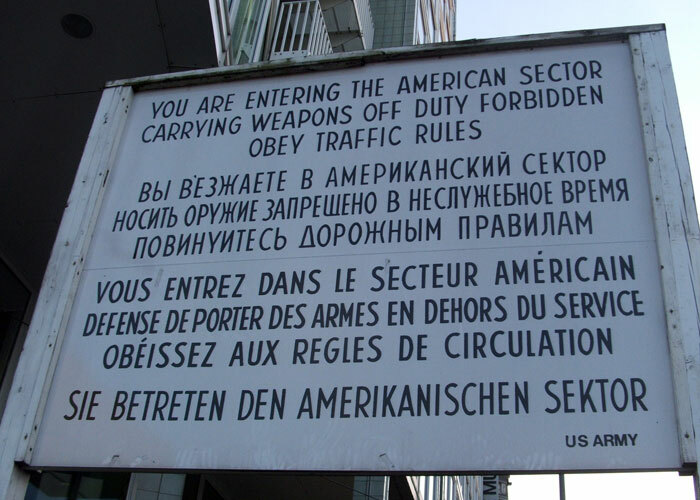 That wouldnt have happened 20 years ago! 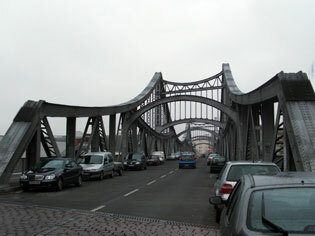 Monday Morning and a 7.30am stroll around the ‘ost’. 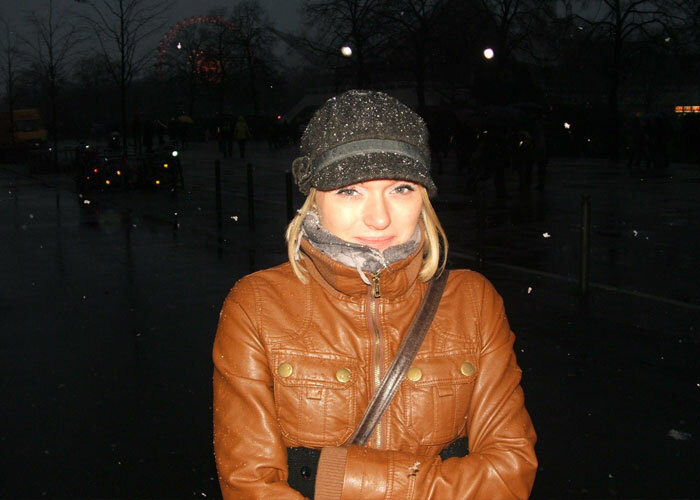 (Clare slept on in bed!) 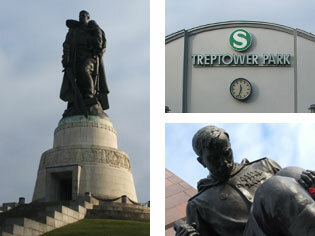 With no tourists and only commuters for company, it allowed me plenty of time to take some pictures of the former Communist East. 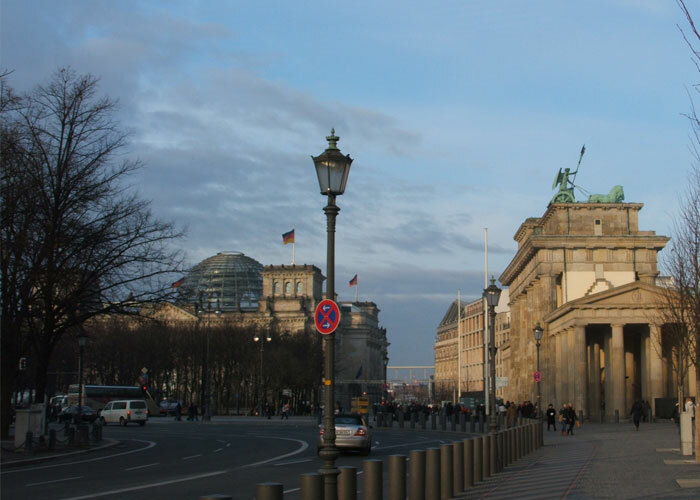 Walking around the start of Karl Marx Allee, gives you a clear indication of long and vast the road is. 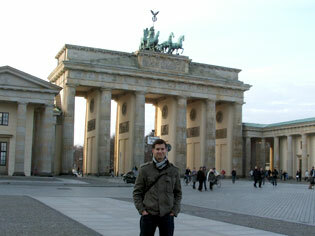 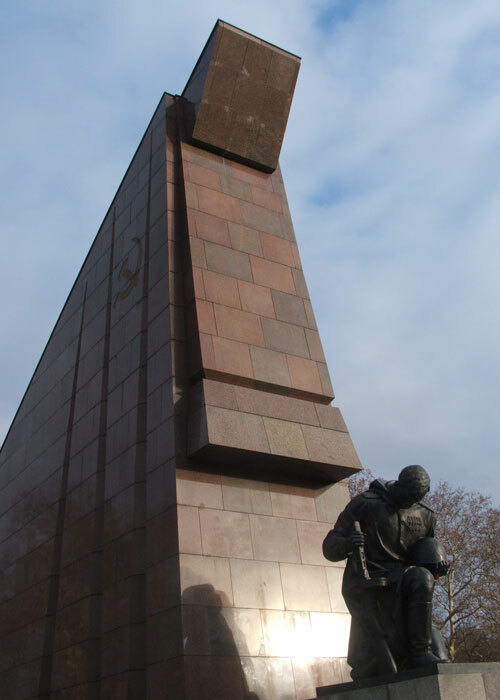 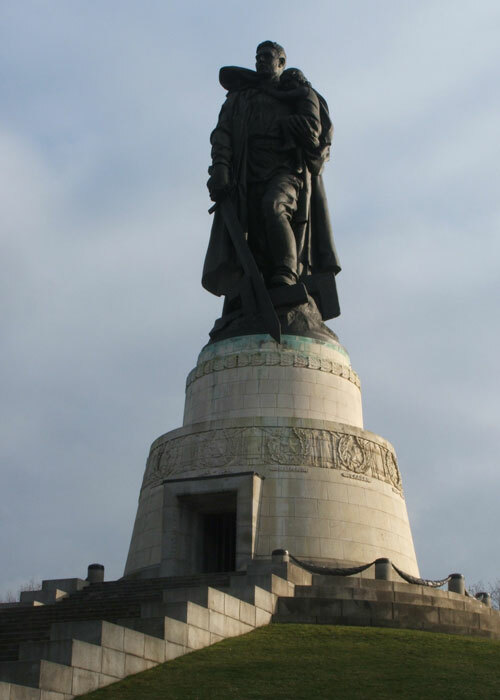 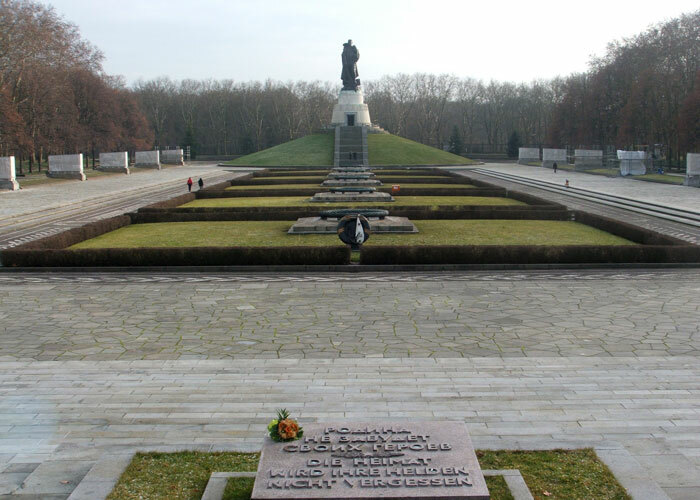 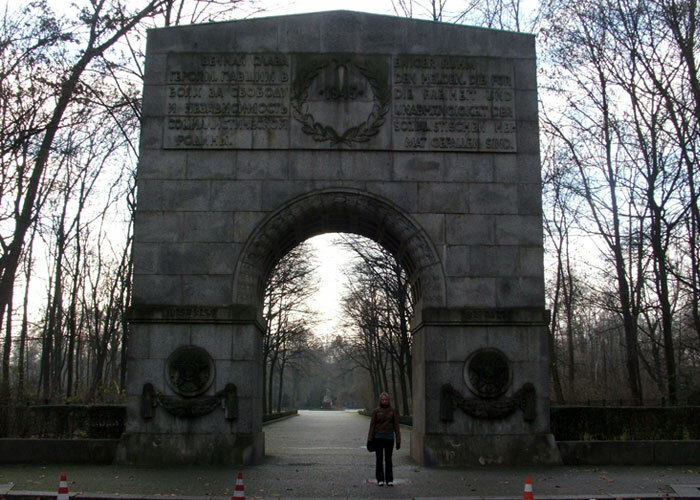 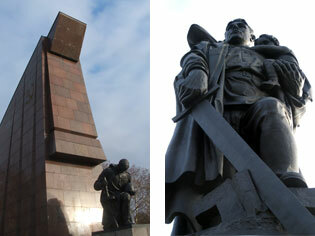 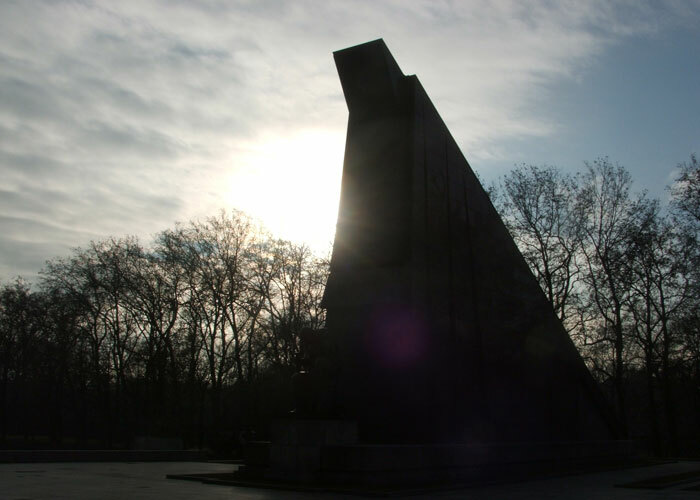 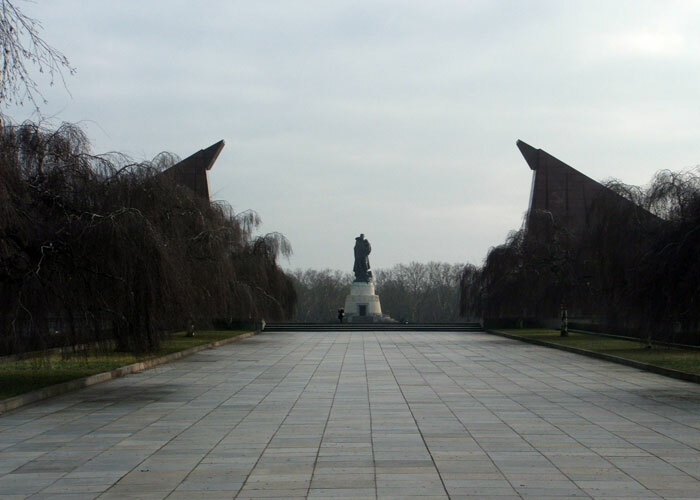 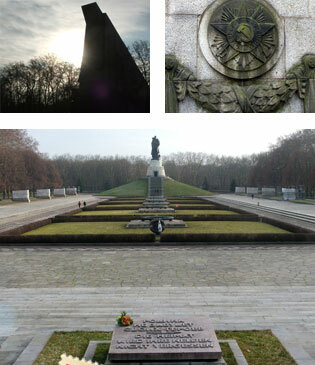 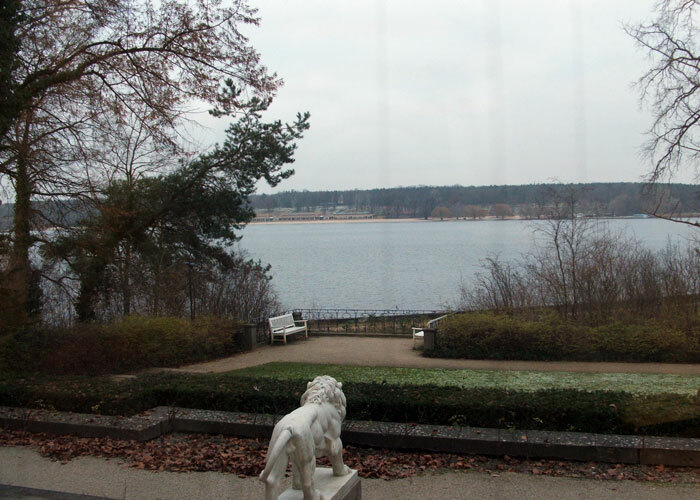 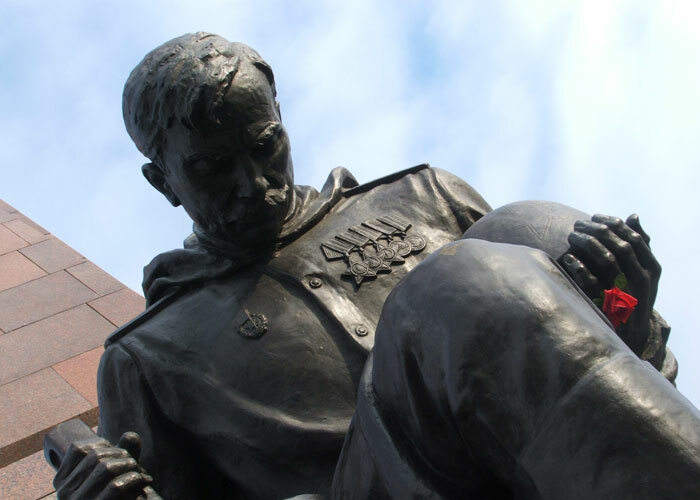 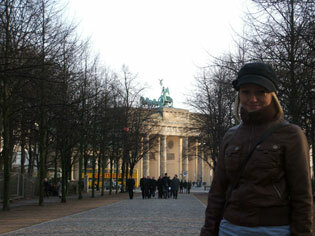 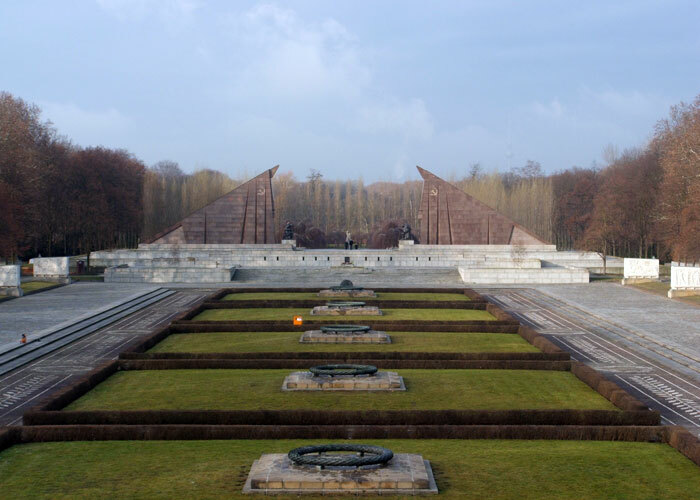 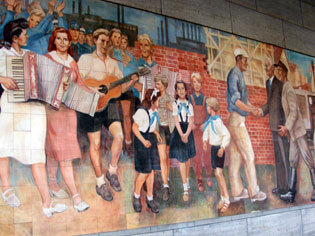 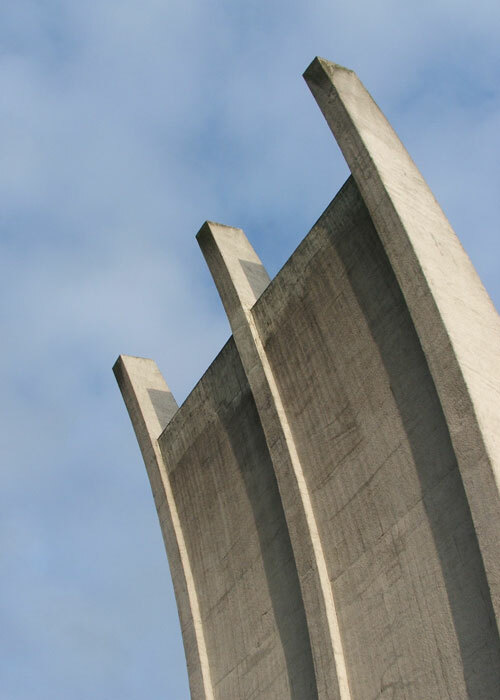 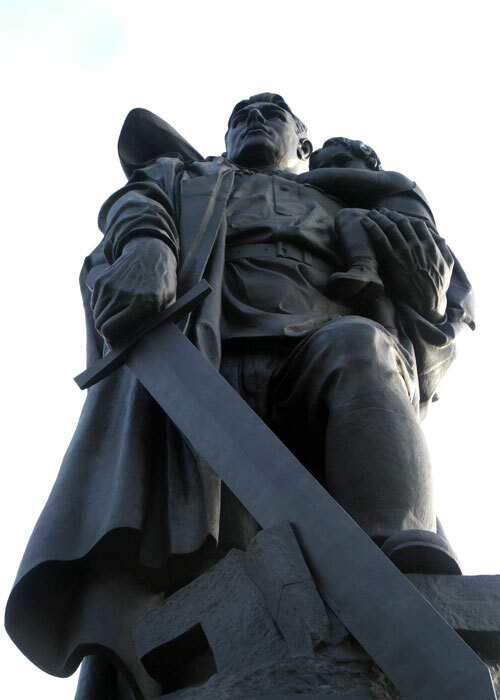 Home to the final resting place of over 5000 Russian dead, Treptower park is another of Berlins Time warps. 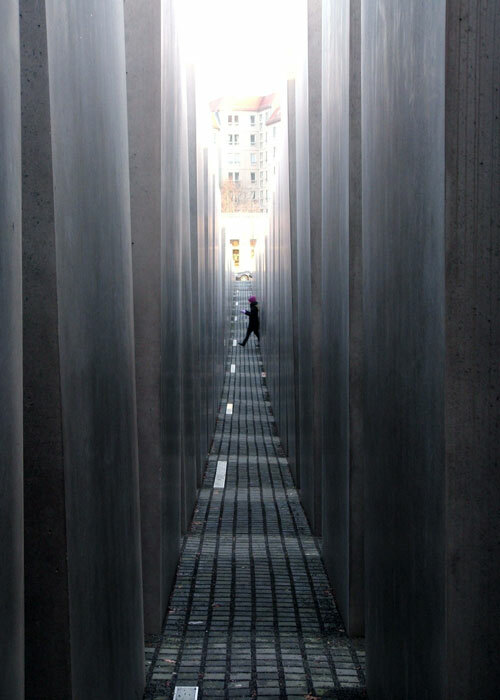 The morning we visited only one other person was there. 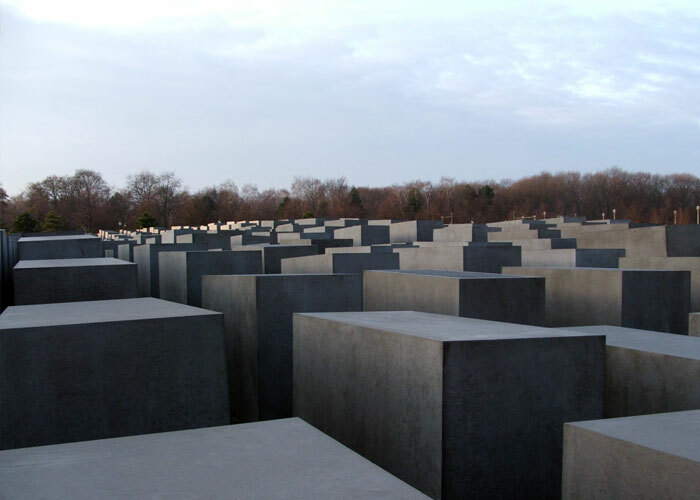 This huge monument built from marble from Hitlers bunker, once again provides you the clear lines that once divided this city. 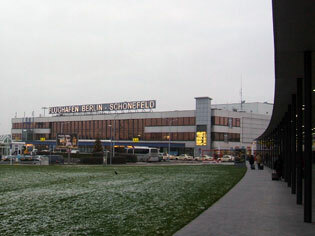 With the last flights taking off on Nov 24 2008, the ‘mother of all airports’ was no more. 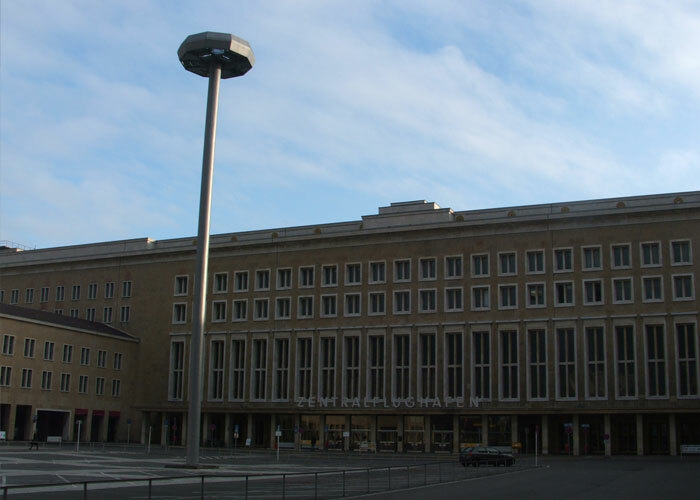 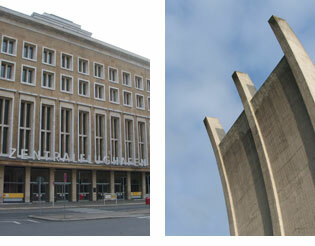 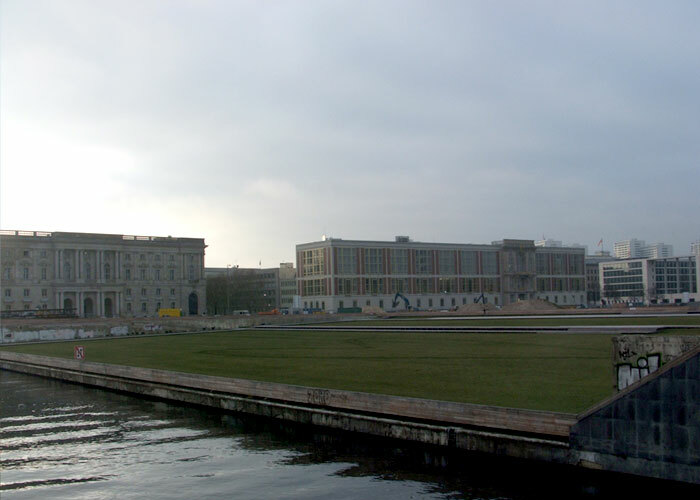 Built by the Nazi’s, Templehof Flughafen, was once among the top 20 largest buildings in the world. 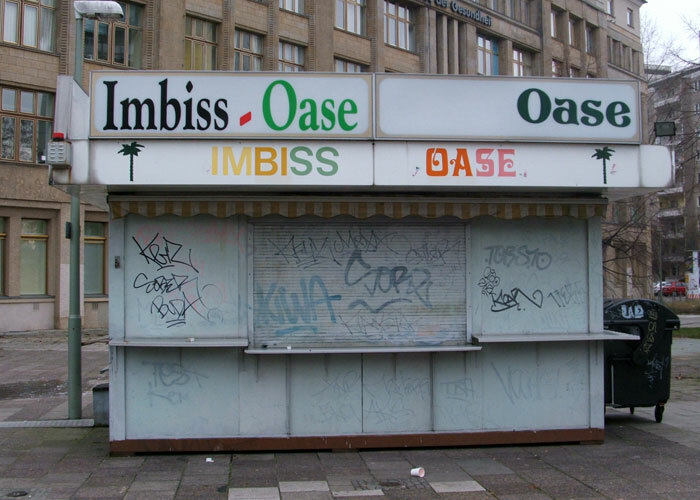 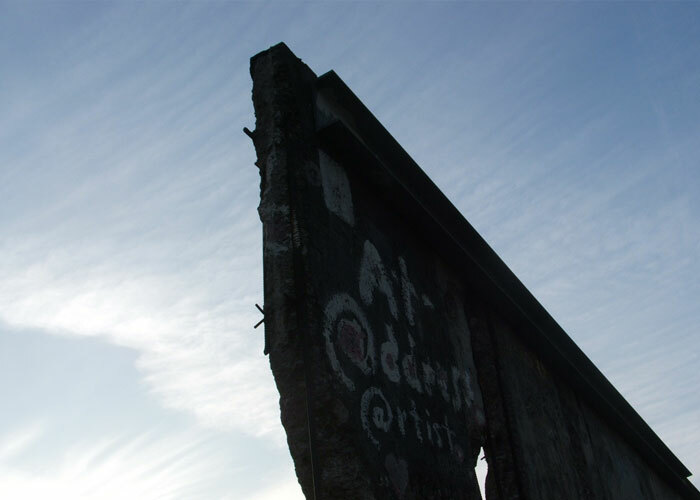 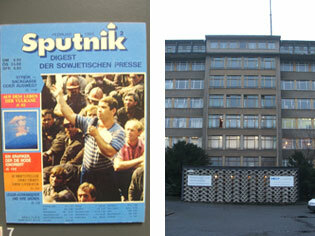 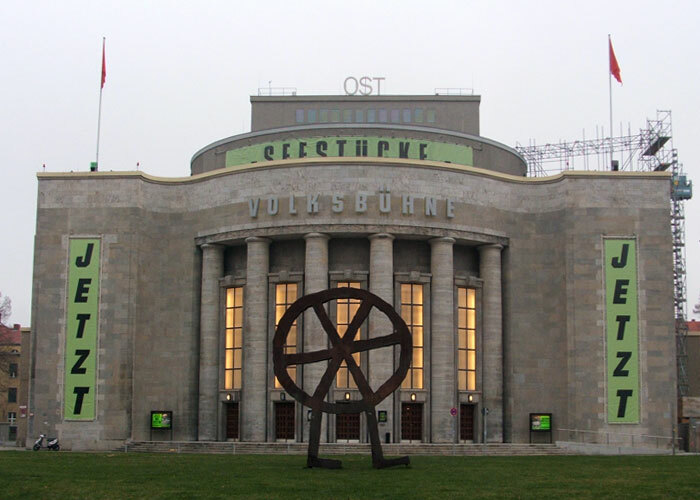 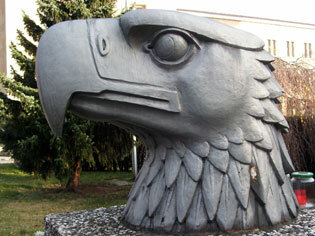 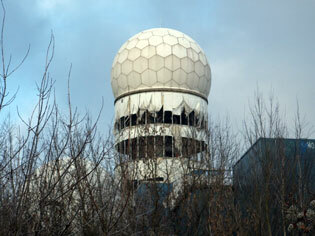 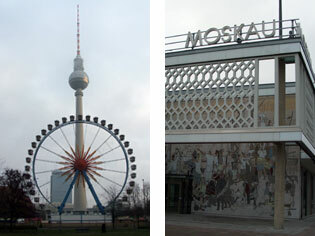 Once the centre of the Berlin airlifts, it now sits abandoned facing an uncertain future, a deserted relic of the past. 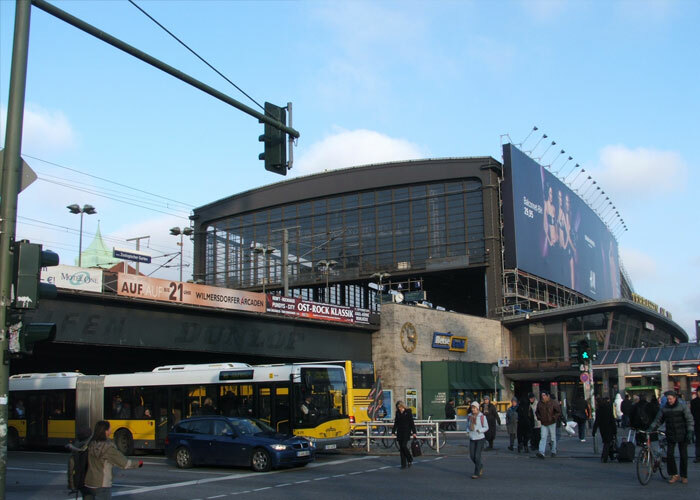 Once the centre of the West Berlin, KuDam is the London equivalent of Oxford Street; A good location to spend some hard earned euros! 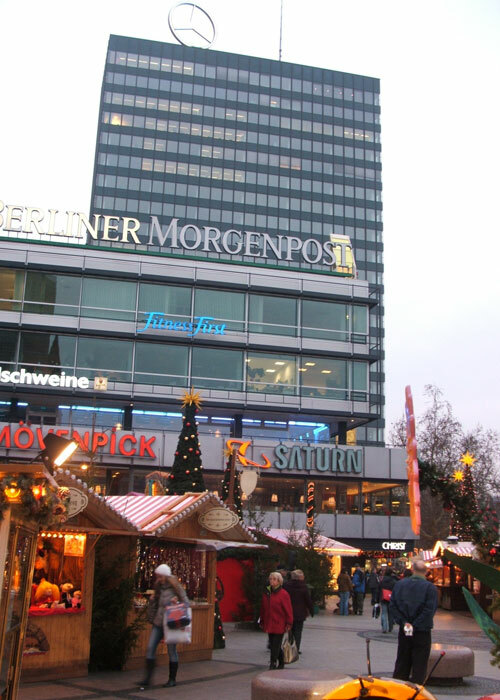 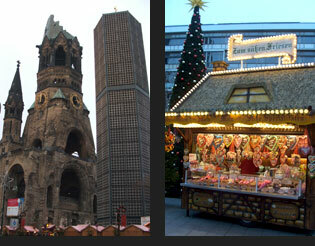 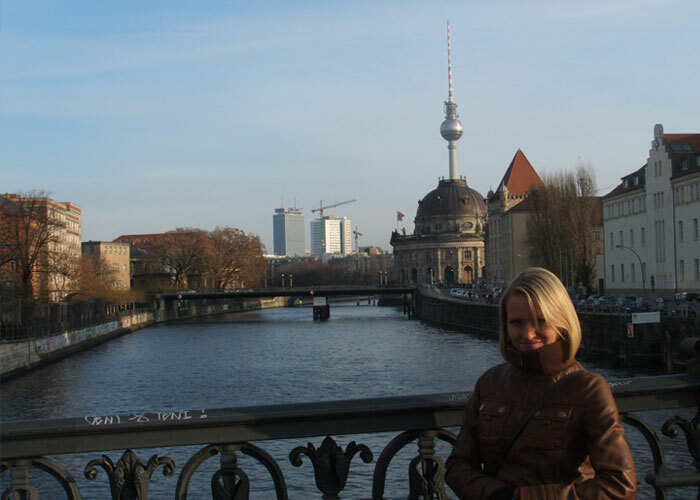 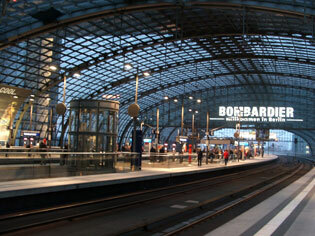 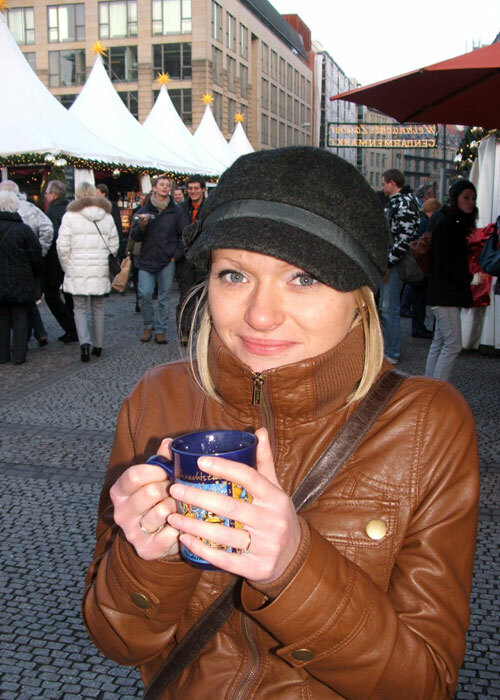 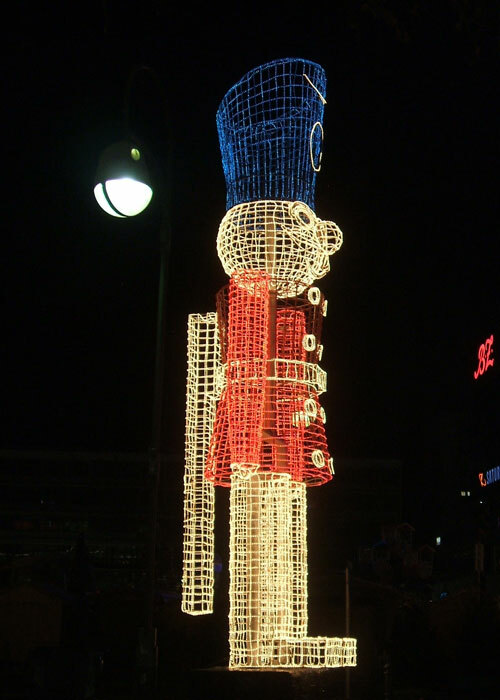 Also Pictured; Berlin Hauptbahnhof and our last visit to a Christmas Market. 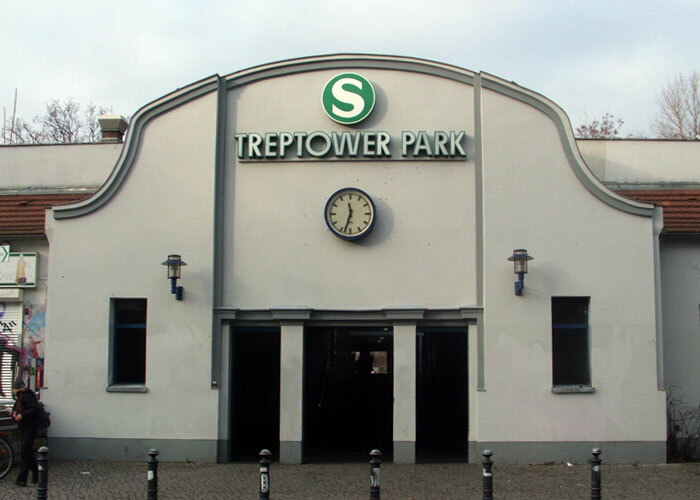 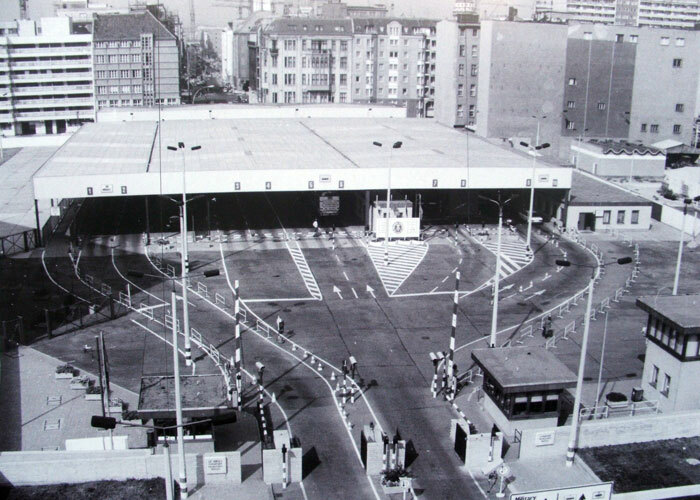 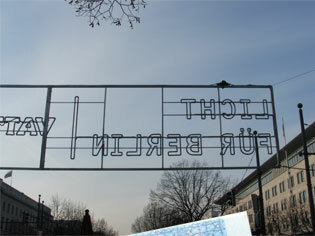 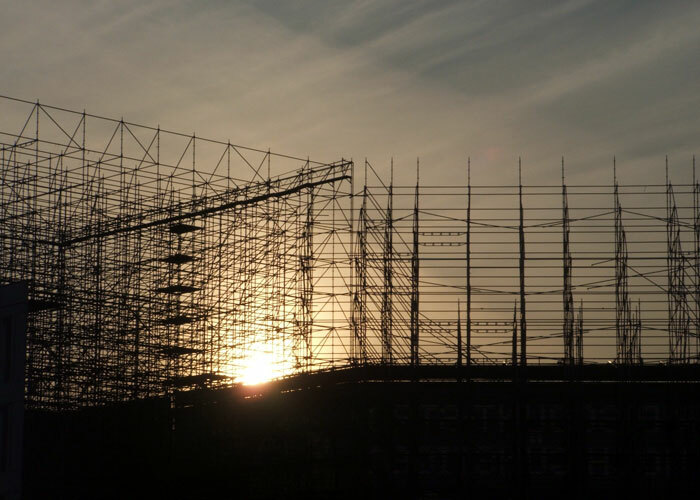 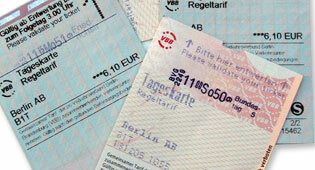 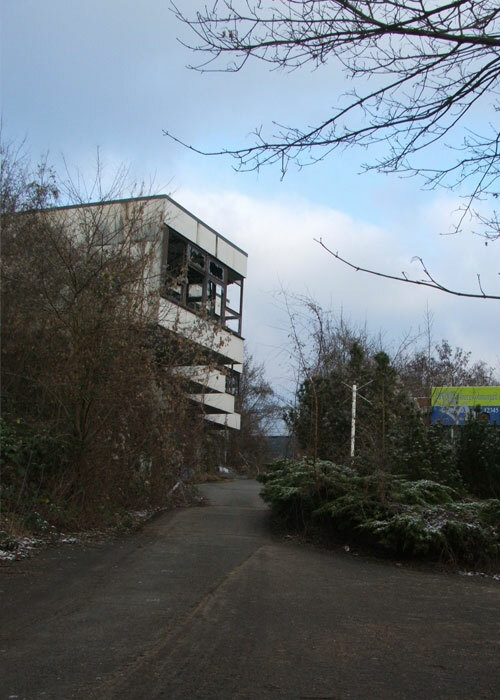 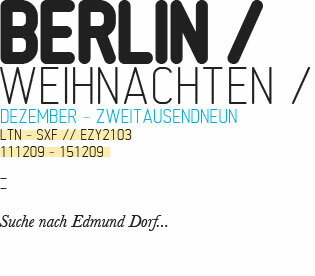 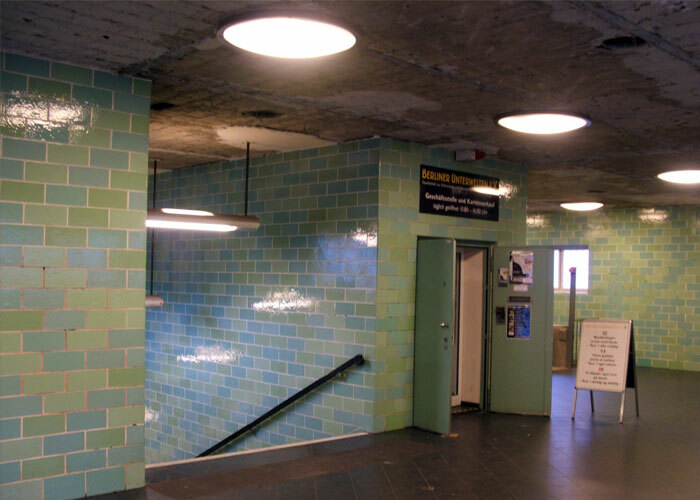 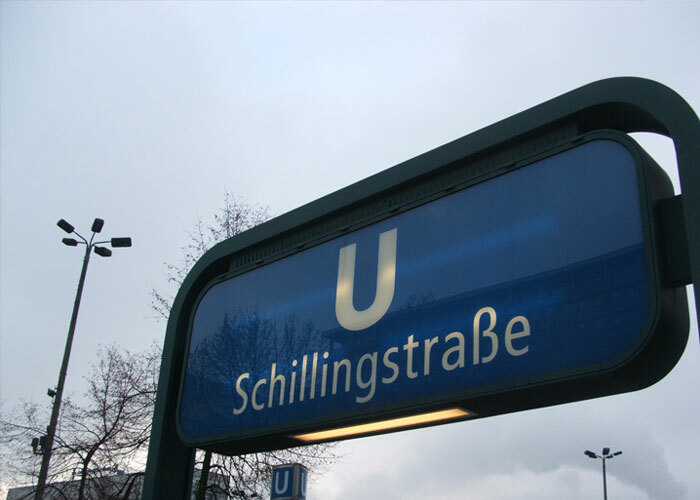 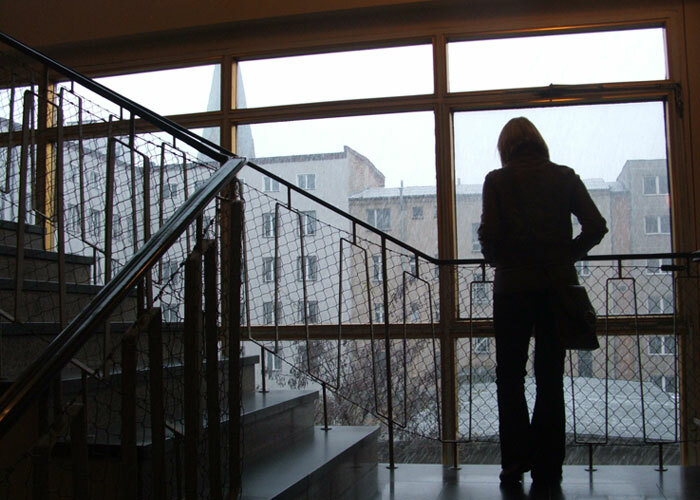 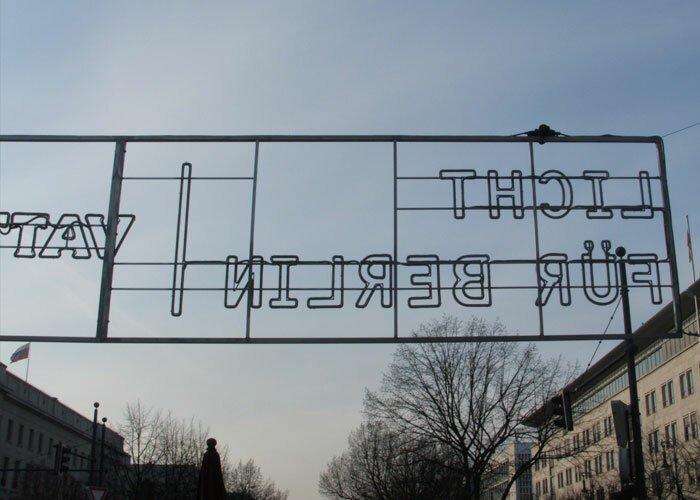 Unlike Templehof, Berlin Schoenfeld has a brighter future…although not in its current form. 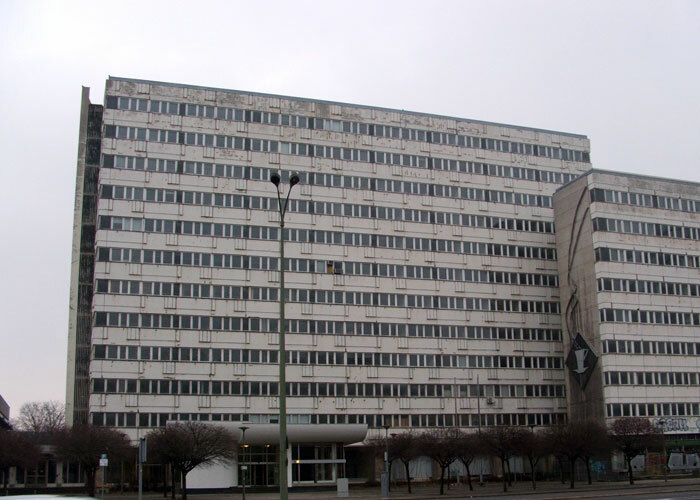 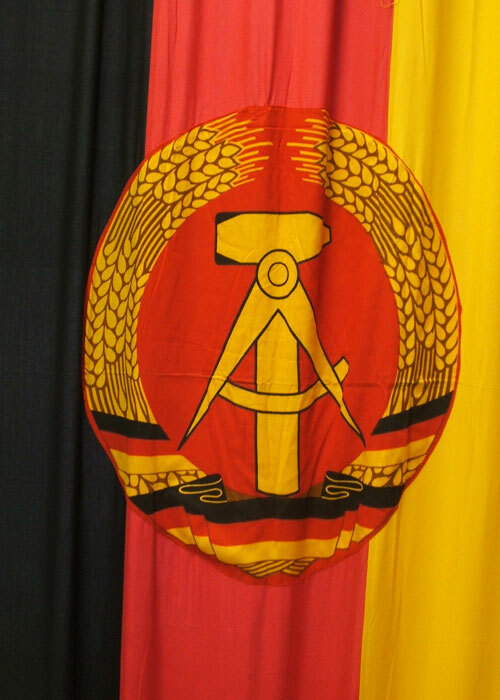 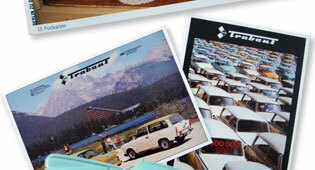 The old East German Airport is to undergo a massive transformation to become Berlin Brandenburg International. 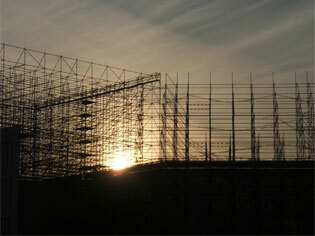 The new airport is taking shape, with the new terminal visible form take off.